CRISPR (/ˈkrɪspər/) is a family of DNA sequences in bacteria and archaea. The sequences contain snippets of DNA from viruses that have attacked the prokaryote. These snippets are used by the prokaryote to detect and destroy DNA from similar viruses during subsequent attacks. These sequences play a key role in a prokaryotic defense system, and form the basis of a technology known as CRISPR/Cas9 that effectively and specifically changes genes within organisms. CRISPR is an abbreviation of Clustered Regularly Interspaced Short Palindromic Repeats. The name was minted at a time when the origin and use of the interspacing subsequences were not known. At that time the CRISPRs were described as segments of prokaryotic DNA containing short, repetitive base sequences. In a palindromic repeat, the sequence of nucleotides is the same in both directions. Each repetition is followed by short segments of spacer DNA from previous exposures to foreign DNA (e.g., a virus or plasmid). Small clusters of cas (CRISPR-associated) genes are located next to CRISPR sequences. The CRISPR/Cas system is a prokaryotic immune system that confers resistance to foreign genetic elements such as those present within plasmids and phages that provides a form of acquired immunity. RNA harboring the spacer sequence helps Cas (CRISPR-associated) proteins recognize and cut exogenous DNA. Other RNA-guided Cas proteins cut foreign RNA. CRISPRs are found in approximately 50% of sequenced bacterial genomes and nearly 90% of sequenced archaea. A simple version of the CRISPR/Cas system, CRISPR/Cas9, has been modified to edit genomes. By delivering the Cas9 nuclease complexed with a synthetic guide RNA (gRNA) into a cell, the cell's genome can be cut at a desired location, allowing existing genes to be removed and/or new ones added. The Cas9-gRNA complex corresponds with the CAS III CRISPR-RNA complex in the above diagram. CRISPR/Cas genome editing techniques have many potential applications, including medicine and crop seed enhancement. The use of CRISPR/Cas9-gRNA complex for genome editing was the AAAS's choice for breakthrough of the year in 2015. Bioethical concerns have been raised about the prospect of using CRISPR for germline editing. The discovery of clustered DNA repeats occurred independently in three parts of the world. The first description of what would later be called CRISPR is from Osaka University researcher Yoshizumi Ishino and his colleagues in 1987. They accidentally cloned part of a CRISPR together with the iap gene, the target of interest. The organization of the repeats was unusual because repeated sequences are typically arranged consecutively along DNA. They studied the relation of "iap" to the bacterium E. coli. The function of the interrupted clustered repeats was not known at the time. In 1993 researchers of Mycobacterium tuberculosis in the Netherlands published two articles about a cluster of interrupted direct repeats (DR) in this bacterium. These researchers recognized the diversity of the DR-intervening sequences among different strains of M. tuberculosis and used this property to design a typing method that was named spoligotyping, which is still in use today. A major addition to the understanding of CRISPR came with Jansen's observation that the prokaryote repeat cluster was accompanied by a set of homologous genes that make up CRISPR-associated systems or cas genes. Four cas genes (cas 1 - 4) were initially recognized. The Cas proteins showed helicase and nuclease motifs, suggesting a role in the dynamic structure of the CRISPR loci. In this publication the acronym CRISPR was coined as the universal name of this pattern. However, the CRISPR function remained enigmatic. Simplified diagram of a CRISPR locus. The three major components of a CRISPR locus are shown: cas genes, a leader sequence, and a repeat-spacer array. Repeats are shown as gray boxes and spacers are colored bars. The arrangement of the three components is not always as shown. In addition, several CRISPRs with similar sequences can be present in a single genome, only one of which is associated with cas genes. In 2005, three independent research groups showed that some CRISPR spacers are derived from phage DNA and extrachromosomal DNA such as plasmids. In effect, the spacers are fragments of DNA gathered from viruses that previously tried to attack the cell. The source of the spacers was a sign that the CRISPR/cas system could have a role in adaptive immunity in bacteria. All three studies proposing this idea were initially rejected by high-profile journals, but eventually appeared in other journals. The first publication proposing a role of CRISPR-Cas in microbial immunity, by the researchers at the University of Alicante, predicted a role for the RNA transcript of spacers on target recognition in a mechanism that could be analogous to the RNA interference system used by eukaryotic cells. Koonin and colleagues extended this RNA interference hypothesis by proposing mechanisms of action for the different CRISPR-Cas subtypes according to the predicted function of their proteins. Experimental work by several groups revealed the basic mechanisms of CRISPR-Cas immunity. In 2007 the first experimental evidence that CRISPR was an adaptive immune system was published. A CRISPR region in Streptococcus thermophilus acquired spacers from the DNA of an infecting bacteriophage. The researchers manipulated the resistance of S. thermophilus to phage by adding and deleting spacers whose sequence matched those found in the tested phages. In 2008, Brouns and Van der Oost identified a complex of Cas proteins (called Cascade) that in E. coli cut the CRISPR RNA precursor within the repeats into mature spacer-containing RNA molecules (crRNA), which remained bound to the protein complex. Moreover, it was found that Cascade, crRNA and a helicase/nuclease (Cas3) were required to provide a bacterial host with immunity against infection by a DNA virus. By designing an anti-virus CRISPR, they demonstrated that two orientations of the crRNA (sense/antisense) provided immunity, indicating that the crRNA guides were targeting dsDNA. That year Marraffini and Sontheimer indeed confirmed that a CRISPR sequence of S. epidermidis targeted DNA and not RNA to prevent conjugation. This finding was at odds with the proposed RNA-interference-like mechanism of CRISPR-Cas immunity, although a CRISPR-Cas system that targets foreign RNA was later found in Pyrococcus furiosus. A 2010 study showed that CRISPR-Cas cuts both strands of phage and plasmid DNA in S. thermophilus. Researchers studied a simpler CRISPR system from Streptococcus pyogenes that relies on the protein Cas9. The Cas9 endonuclease is a four-component system that includes two small RNA molecules named CRISPR RNA (crRNA) and trans-activating CRISPR RNA (tracrRNA). Jennifer Doudna and Emmanuelle Charpentier re-engineered the Cas9 endonuclease into a more manageable two-component system by fusing the two RNA molecules into a "single-guide RNA" that, when combined with Cas9, could find and cut the DNA target specified by the guide RNA. By manipulating the nucleotide sequence of the guide RNA, the artificial Cas9 system could be programmed to target any DNA sequence for cleavage. Another group of collaborators comprising Virginijus Šikšnys together with Gasiūnas, Barrangou and Horvath showed that Cas9 from the S. thermophilus CRISPR system can also be reprogrammed to target a site of their choosing by changing the sequence of its crRNA. These advances fueled efforts to edit genomes with the modified CRISPR-Cas9 system. Feng Zhang's and George Church's groups simultaneously described genome editing in human cell cultures using CRISPR-Cas9 for the first time. It has since been used in a wide range of organisms, including baker's yeast (Saccharomyces cerevisiae), the opportunistic pathogen Candida albicans, zebrafish (Danio rerio), fruit flies (Drosophila melanogaster), nematodes (Caenorhabditis elegans), plants, mice, monkeys and human embryos. CRISPR has been modified to make programmable transcription factors that allow scientists to target and activate or silence specific genes. The CRIPSR/Cas9 system has shown to make effective gene edits in Human tripronuclear zygotes first described in a 2015 paper by Chinese scientists P. Liang and Y. Xu. The system made a successful cleavage of mutant Beta-Hemoglobin (HBB) in 28 out of 54 embryos. 4 out of the 28 embryos were successfully recombined using a donor template given by the scientists. The scientists showed that during DNA recombination of the cleaved strand, the homologous endogenous sequence HBD competes with the exogenous donor template. DNA repair in human embryos is much more complicated and particular than in derived stem cells. In 2015, the nuclease Cpf1 was characterized in the CRISPR/Cpf1 system of the bacterium Francisella novicida. The name, from a TIGRFAMs protein family definition built in 2012, reflects the prevalence of its CRISPR-Cas subtype in the Prevotella and Francisella lineages. Cpf1 showed several key differences from Cas9 including: causing a 'staggered' cut in double stranded DNA as opposed to the 'blunt' cut produced by Cas9, relying on a 'T rich' PAM (providing alternate targeting sites to Cas9) and requiring only a CRISPR RNA (crRNA) for successful targeting. By contrast Cas9 requires both crRNA and a transactivating crRNA (tracrRNA). These differences may give Cpf1 some advantages over Cas9. For example, Cpf1's small crRNAs are ideal for multiplexed genome editing, as more of them can be packaged in one vector than can Cas9's sgRNAs. As well, the sticky 5' overhangs left by Cpf1 can be used for DNA assembly that is much more target-specific than traditional Restriction Enzyme cloning. Finally, Cpf1 cleaves DNA 18-23 base pairs downstream from the PAM site. This means there is no disruption to the recognition sequence after repair, and so Cpf1 enables multiple rounds of DNA cleavage. By contrast, since Cas9 cuts only 3 base pairs upstream of the PAM site, the NHEJ pathway results in indel mutations which destroy the recognition sequence, thereby preventing further rounds of cutting. In theory, repeated rounds of DNA cleavage should cause an increased opportunity for the desired genomic editing to occur. The CRISPR array comprises an AT-rich leader sequence followed by short repeats that are separated by unique spacers. CRISPR repeats typically range in size from 28 to 37 base pairs (bps), though there can be as few as 23 bp and as many as 55 bp. Some show dyad symmetry, implying the formation of a secondary structure such as a stem-loop ('hairpin') in the RNA, while others are predicted to be unstructured. The size of spacers in different CRISPR arrays is typically 32 to 38 bp (range 21 to 72 bp). New spacers can appear rapidly as part of the immune response to phage infection. There are usually fewer than 50 units of the repeat-spacer sequence in a CRISPR array. Small clusters of cas genes are often located next to CRISPR repeat-spacer arrays. Collectively the 93 cas genes are grouped into 35 families based on sequence similarity of the encoded proteins. 11 of the 35 families form the cas core, which includes the protein families Cas1 through Cas9. 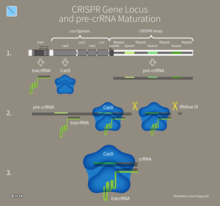 A complete CRISPR-Cas locus has at least one gene belonging to the cas core. CRISPR-Cas systems fall into two classes. Class 1 systems use a complex of multiple Cas proteins to degrade foreign nucleic acids. Class 2 systems use a single large Cas protein for the same purpose. Class 1 is divided into types I, III, and IV; class 2 is divided into types II, V, and VI. The 6 system types are divided into 19 subtypes. Each type and most subtypes are characterized by a "signature gene" found almost exclusively in the category. Classification is also based on the complement of cas genes that are present. Most CRISPR-Cas systems have a Cas1 protein. The phylogeny of Cas1 proteins generally agrees with the classification system. Many organisms contain multiple CRISPR-Cas systems suggesting that they are compatible and may share components. The sporadic distribution of the CRISPR/Cas subtypes suggests that the CRISPR/Cas system is subject to horizontal gene transfer during microbial evolution. Signature genes and their putative functions for the major and minor CRISPR-cas types. The CRISPR genetic locus provides bacteria with a defense mechanism to protect them from repeated phage infections. CRISPR-Cas9 as a Molecular Tool Introduces Targeted Double Strand DNA Breaks. Double Strand DNA Breaks Introduced by CRISPR-Cas9 Allows Further Genetic Manipulation By Exploiting Endogenous DNA Repair Mechanisms. The stages of CRISPR immunity for each of the three major types of adaptive immunity. (1) Acquisition begins by recognition of invading DNA by Cas1 and Cas2 and cleavage of a protospacer. (2) The protospacer is ligated to the direct repeat adjacent to the leader sequence and (3) single strand extension repairs the CRISPR and duplicates the direct repeat. The crRNA processing and interference stages occur differently in each of the three major CRISPR systems. (4) The primary CRISPR transcript is cleaved by cas genes to produce crRNAs. (5) In type I systems Cas6e/Cas6f cleave at the junction of ssRNA and dsRNA formed by hairpin loops in the direct repeat. Type II systems use a trans-activating (tracr) RNA to form dsRNA, which is cleaved by Cas9 and RNaseIII. Type III systems use a Cas6 homolog that does not require hairpin loops in the direct repeat for cleavage. (6) In type II and type III systems secondary trimming is performed at either the 5’ or 3’ end to produce mature crRNAs. (7) Mature crRNAs associate with Cas proteins to form interference complexes. (8) In type I and type II systems, interactions between the protein and PAM sequence are required for degradation of invading DNA. Type III systems do not require a PAM for successful degradation and in type III-A systems basepairing occurs between the crRNA and mRNA rather than the DNA, targeted by type III-B systems. CRISPR-Cas immunity is a natural process of bacteria and archaea. CRISPR-Cas prevents bacteriophage infection, conjugation and natural transformation by degrading foreign nucleic acids that enter the cell. When a microbe is invaded by a virus, the first stage of the immune response is to capture viral DNA and insert it into a CRISPR locus in the form of a spacer. Cas1 and Cas2 are found in both types of CRISPR-Cas immune systems, which indicates that they are involved in spacer acquisition. Mutation studies confirmed this hypothesis, showing that removal of cas1 or cas2 stopped spacer acquisition, without affecting CRISPR immune response. Multiple Cas1 proteins have been characterised and their structures resolved. Cas1 proteins have diverse amino acid sequences. However, their crystal structures are similar and all purified Cas1 proteins are metal-dependent nucleases/integrases that bind to DNA in a sequence-independent manner. Representative Cas2 proteins have been characterised and possess either (single strand) ssRNA- or (double strand) dsDNA- specific endoribonuclease activity. In the I-E system of E. coli Cas1 and Cas2 form a complex where a Cas2 dimer bridges two Cas1 dimers. In this complex Cas2 performs a non-enzymatic scaffolding role, binding double-stranded fragments of invading DNA, while Cas1 binds the single-stranded flanks of the DNA and catalyses their integration into CRISPR arrays. New spacers are usually added at the beginning of the CRISPR next to the leader sequence creating a chronological record of viral infections. In E. Coli a histone like protein called integration host factor (IHF), which binds to the leader sequence, is responsible for the accuracy of this integration. Bioinformatic analysis of regions of phage genomes that were excised as spacers (termed protospacers) revealed that they were not randomly selected but instead were found adjacent to short (3 – 5 bp) DNA sequences termed protospacer adjacent motifs (PAM). Analysis of CRISPR-Cas systems showed PAMs to be important for type I and type II, but not type III systems during acquisition. In type I and type II systems, protospacers are excised at positions adjacent to a PAM sequence, with the other end of the spacer cut using a ruler mechanism, thus maintaining the regularity of the spacer size in the CRISPR array. The conservation of the PAM sequence differs between CRISPR-Cas systems and appears to be evolutionarily linked to Cas1 and the leader sequence. New spacers are added to a CRISPR array in a directional manner, occurring preferentially, but not exclusively, adjacent to the leader sequence. Analysis of the type I-E system from E. coli demonstrated that the first direct repeat adjacent to the leader sequence, is copied, with the newly acquired spacer inserted between the first and second direct repeats. The PAM sequence appears to be important during spacer insertion in type I-E systems. That sequence contains a strongly conserved final nucleotide (nt) adjacent to the first nt of the protospacer. This nt becomes the final base in the first direct repeat. This suggests that the spacer acquisition machinery generates single-stranded overhangs in the second-to-last position of the direct repeat and in the PAM during spacer insertion. However, not all CRISPR-Cas systems appear to share this mechanism as PAMs in other organisms do not show the same level of conservation in the final position. It is likely that in those systems, a blunt end is generated at the very end of the direct repeat and the protospacer during acquisition. Analysis of Sulfolobus solfataricus CRISPRs revealed further complexities to the canonical model of spacer insertion, as one of its six CRISPR loci inserted new spacers randomly throughout its CRISPR array, as opposed to inserting closest to the leader sequence. Multiple CRISPRs contain many spacers to the same phage. The mechanism that causes this phenomenon was discovered in the type I-E system of E. coli. A significant enhancement in spacer acquisition was detected where spacers already target the phage, even mismatches to the protospacer. This ‘priming’ requires the Cas proteins involved in both acquisition and interference to interact with each other. Newly acquired spacers that result from the priming mechanism are always found on the same strand as the priming spacer. This observation led to the hypothesis that the acquisition machinery slides along the foreign DNA after priming to find a new protospacer. CRISPR-RNA (crRNA), which later guides the Cas nuclease to the target during the interference step, must be generated from the CRISPR sequence. The crRNA is initially transcribed as part of a single long transcript encompassing much of the CRISPR array. This transcript is then cleaved by Cas proteins to form crRNAs. The mechanism to produce crRNAs differs among CRISPR/Cas systems. In type I-E and type I-F systems, the proteins Cas6e and Cas6f respectively, recognise stem-loops created by the pairing of identical repeats that flank the crRNA. These Cas proteins cleave the longer transcript at the edge of the paired region, leaving a single crRNA along with a small remnant of the paired repeat region. Type III systems also use Cas6, however their repeats do not produce stem-loops. Cleavage instead occurs by the longer transcript wrapping around the Cas6 to allow cleavage just upstream of the repeat sequence. Type II systems lack the Cas6 gene and instead utilize RNaseIII for cleavage. Functional type II systems encode an extra small RNA that is complementary to the repeat sequence, known as a trans-activating crRNA (tracrRNA). Transcription of the tracrRNA and the primary CRISPR transcript results in base pairing and the formation of dsRNA at the repeat sequence, which is subsequently targeted by RNaseIII to produce crRNAs. Unlike the other two systems the crRNA does not contain the full spacer, which is instead truncated at one end. CrRNAs associate with Cas proteins to form ribonucleotide complexes that recognize foreign nucleic acids. CrRNAs show no preference between the coding and non-coding strands, which is indicative of an RNA-guided DNA-targeting system. The type I-E complex (commonly referred to as Cascade) requires five Cas proteins bound to a single crRNA. During the interference stage in type I systems the PAM sequence is recognized on the crRNA-complementary strand and is required along with crRNA annealing. In type I systems correct base pairing between the crRNA and the protospacer signals a conformational change in Cascade that recruits Cas3 for DNA degradation. Type II systems rely on a single multifunctional protein, Cas9, for the interference step. Cas9 requires both the crRNA and the tracrRNA to function and cleaves DNA using its dual HNH and RuvC/RNaseH-like endonuclease domains. Basepairing between the PAM and the phage genome is required in type II systems. However, the PAM is recognized on the same strand as the crRNA (the opposite strand to type I systems). Type III systems, like type I require six or seven Cas proteins binding to crRNAs. The type III systems analysed from S. solfataricus and P. furiosus both target the mRNA of phages rather than phage DNA genome, which may make these systems uniquely capable of targeting RNA-based phage genomes. The mechanism for distinguishing self from foreign DNA during interference is built into the crRNAs and is therefore likely common to all three systems. Throughout the distinctive maturation process of each major type, all crRNAs contain a spacer sequence and some portion of the repeat at one or both ends. It is the partial repeat sequence that prevents the CRISPR-Cas system from targeting the chromosome as base pairing beyond the spacer sequence signals self and prevents DNA cleavage. RNA-guided CRISPR enzymes are classified as type V restriction enzymes. A bioinformatic study has suggested that CRISPRs are evolutionarily conserved and cluster into related types. Many show signs of a conserved secondary structure. CRISPR/Cas can immunize bacteria against certain phages and thus halt transmission. For this reason, Koonin described CRISPR/Cas as a Lamarckian inheritance mechanism. However, this was disputed by a critic who noted, "We should remember [Lamarck] for the good he contributed to science, not for things that resemble his theory only superficially. Indeed, thinking of CRISPR and other phenomena as Lamarckian only obscures the simple and elegant way evolution really works". Analysis of CRISPR sequences revealed coevolution of host and viral genomes. Cas9 proteins are highly enriched in pathogenic and commensal bacteria. CRISPR/Cas-mediated gene regulation may contribute to the regulation of endogenous bacterial genes, particularly during interaction with eukaryotic hosts. For example, Francisella novicida uses a unique, small, CRISPR/Cas-associated RNA (scaRNA) to repress an endogenous transcript encoding a bacterial lipoprotein that is critical for F. novicida to dampen host response and promote virulence. The basic model of CRISPR evolution is newly incorporated spacers driving phages to mutate their genomes to avoid the bacterial immune response, creating diversity in both the phage and host populations. 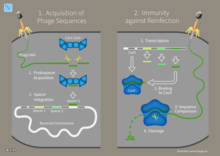 To fight off a phage infection, the sequence of the CRISPR spacer must correspond perfectly to the sequence of the target phage gene. Phages can continue to infect their hosts given point mutations in the spacer. Similar stringency is required in PAM or the bacterial strain remains phage sensitive. A study of 124 S. thermophilus strains showed that 26% of all spacers were unique and that different CRISPR loci showed different rates of spacer acquisition. Some CRISPR loci evolve more rapidly than others, which allowed the strains' phylogenetic relationships to be determined. A comparative genomic analysis showed that E. coli and S. enterica evolve much more slowly than S. thermophilus. The latter's strains that diverged 250 thousand years ago still contained the same spacer complement. Metagenomic analysis of two acid mine drainage biofilms showed that one of the analyzed CRISPRs contained extensive deletions and spacer additions versus the other biofilm, suggesting a higher phage activity/prevalence in one community than the other. In the oral cavity, a temporal study determined that 7-22% of spacers were shared over 17 months within an individual while less than 2% were shared across individuals. From the same environment a single strain was tracked using PCR primers specific to its CRISPR system. Broad-level results of spacer presence/absence showed significant diversity. However, this CRISPR added 3 spacers over 17 months, suggesting that even in an environment with significant CRISPR diversity some loci evolve slowly. CRISPRs were analysed from the metagenomes produced for the human microbiome project. Although most were body-site specific, some within a body site are widely shared among individuals. One of these loci originated from streptococcal species and contained ~15,000 spacers, 50% of which were unique. Similar to the targeted studies of the oral cavity, some showed little evolution over time. CRISPR evolution was studied in chemostats using S. thermophilus to directly examine spacer acquisition rates. In one week, S. thermophilus strains acquired up to three spacers when challenged with a single phage. During the same interval the phage developed single nucleotide polymorphisms that became fixed in the population, suggesting that targeting had prevented phage replication absent these mutations. Another S. thermophilus experiment showed that phages can infect and replicate in hosts that have only one targeting spacer. Yet another showed that sensitive hosts can exist in environments with high phage titres. The chemostat and observational studies suggest many nuances to CRISPR and phage (co)evolution. CRISPRs are widely distributed among bacteria and archaea and show some sequence similarities. Their most notable characteristic is their repeating spacers and direct repeats. This characteristic makes CRISPRs easily identifiable in long sequences of DNA, since the number of repeats decreases the likelihood of a false positive match. Three programs used for CRISPR repeat identification search for regularly interspaced repeats in long sequences: CRT, PILER-CR and CRISPRfinder. Analysis of CRISPRs in metagenomic data is more challenging, as CRISPR loci do not typically assemble, due to their repetitive nature or through strain variation, which confuses assembly algorithms. Where many reference genomes are available, polymerase chain reaction (PCR) can be used to amplify CRISPR arrays and analyse spacer content. However, this approach yields information only for specifically targeted CRISPRs and for organisms with sufficient representation in public databases to design reliable polymerase chain reaction (PCR) primers. The alternative is to extract and reconstruct CRISPR arrays from shotgun metagenomic data. This is computationally more difficult, particularly with second generation sequencing technologies (e.g. 454, Illumina), as the short read lengths prevent more than two or three repeat units appearing in a single read. CRISPR identification in raw reads has been achieved using purely de novo identification or by using direct repeat sequences in partially assembled CRISPR arrays from contigs (overlapping DNA segments that together represent a consensus region of DNA) and direct repeat sequences from published genomes as a hook for identifying direct repeats in individual reads. Another way for bacteria to defend against phage infection is by having chromosomal islands. A subtype of chromosomal islands called phage-inducible chromosomal island (PICI) is excised from a bacterial chromosome upon phage infection and can inhibit phage replication. The mechanisms that induce PICI excision and how PICI inhibits phage replication are not well understood. One study showed that lytic ICP1 phage, which specifically targets Vibrio cholerae serogroup O1, has acquired a CRISPR/Cas system that targets a V. cholera PICI-like element. The system has 2 CRISPR loci and 9 Cas genes. It seems to be homologous to the 1-F system found in Yersinia pestis. Moreover, like the bacterial CRISPR/Cas system, ICP1 CRISPR/Cas can acquire new sequences, which allows phage and host to co-evolve. By the end of 2014 some 1000 research papers had been published that mentioned CRISPR. The technology had been used to functionally inactivate genes in human cell lines and cells, to study Candida albicans, to modify yeasts used to make biofuels and to genetically modify crop strains. CRISPR can also be used to change mosquitos so they cannot transmit diseases such as malaria. CRISPR-based re-evaluations of claims for gene-disease relationships have led to the discovery of potentially important anomalies. In the early 2000s, researchers developed zinc finger nucleases (ZFNs), synthetic proteins whose DNA-binding domains enable them to create double-stranded breaks in DNA at specific points. In 2010, synthetic nucleases called transcription activator-like effector nucleases (TALENs) provided an easier way to target a double-stranded break to a specific location on the DNA strand. Both zinc finger nucleases and TALENs require the creation of a custom protein for each targeted DNA sequence, which is a more difficult and time-consuming process than that for guide RNAs. CRISPRs are much easier to design because the process requires making only a short RNA sequence. Whereas RNA interference (RNAi) does not fully suppress gene function, CRISPR, ZFNs and TALENs provide full irreversible gene knockout. CRISPR can also target several DNA sites simultaneously by simply introducing different gRNAs. In addition, CRISPR costs are relatively low. CRISPR/Cas9 genome editing is carried out with a Type II CRISPR system. 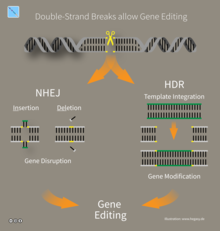 When utilized for genome editing, this system includes Cas9, crRNA, tracrRNA along with an optional section of DNA repair template that is utilized in either non-homologous end joining (NHEJ) or homology directed repair (HDR). crRNA Contains the guide RNA that locates the correct section of host DNA along with a region that binds to tracrRNA (generally in a hairpin loop form) forming an active complex. tracrRNA Binds to crRNA and forms an active complex. Cas9 Protein whose active form is able to modify DNA. Many variants exist with differing functions (i.e. single strand nicking, double strand break, DNA binding) due to Cas9's DNA site recognition function. CRISPR/Cas9 often employs a plasmid to transfect the target cells. The main components of this plasmid are displayed in the image and listed in the table. The crRNA needs to be designed for each application as this is the sequence that Cas9 uses to identify and directly bind to the cell's DNA. The crRNA must bind only where editing is desired. The repair template is designed for each application, as it must overlap with the sequences on either side of the cut and code for the insertion sequence. Multiple crRNAs and the tracrRNA can be packaged together to form a single-guide RNA (sgRNA). This sgRNA can be joined together with the Cas9 gene and made into a plasmid in order to be transfected into cells. CRISPR/Cas9 offers a high degree of fidelity and relatively simple construction. It depends on two factors for its specificity: the target sequence and the PAM. The target sequence is 20 bases long as part of each CRISPR locus in the crRNA array. A typical crRNA array has multiple unique target sequences. Cas9 proteins select the correct location on the host's genome by utilizing the sequence to bond with base pairs on the host DNA. The sequence is not part of the Cas9 protein and as a result is customizable and can be independently synthesized. The PAM sequence on the host genome is recognized by Cas9. Cas9 cannot be easily modified to recognize a different PAM sequence. However this is not too limiting as it is a short sequence and nonspecific (e.g. the SpCas9 PAM sequence is 5'-NGG-3' and in the human genome occurs roughly every 8 to 12 base pairs). Once these have been assembled into a plasmid and transfected into cells the Cas9 protein with the help of the crRNA finds the correct sequence in the host cell's DNA and – depending on the Cas9 variant – creates a single or double strand break in the DNA. Properly spaced single strand breaks in the host DNA can trigger homology directed repair, which is less error prone than the non-homologous end joining that typically follows a double strand break. Providing a DNA repair template allows for the insertion of a specific DNA sequence at an exact location within the genome. The repair template should extend 40 to 90 base pairs beyond the Cas9 induced DNA break. The goal is for the cell's HDR process to utilize the provided repair template and thereby incorporate the new sequence into the genome. Once incorporated, this new sequence is now part of the cell's genetic material and passes into its daughter cells. Many online tools are available to aid in designing effective sgRNA sequences. Delivery of Cas9, sgRNA, and associated complexes into cells can occur via viral and non-viral systems. Electroporation of DNA, RNA, or ribonucleocomplexes is a common technique, though it can result in harmful effects on the target cells. Chemical transfection techniques utilizing lipids have also been used to introduce sgRNA in complex with Cas9 into cells. Hard-to-transfect cells (e.g. stem cells, neurons, and hematopoietic cells) require more efficient delivery systems such as those based on lentivirus (LVs), adenovirus (AdV) and adeno-associated virus (AAV). CRISPRs have been used to cut five to 62 genes at once: pig cells have been engineered to inactivate all 62 Porcine Endogenous Retroviruses in the pig genome, which eliminated transinfection from the pig to human cells in culture. CRISPR's low cost compared to alternatives is widely seen as revolutionary. Several variants of CRISPR/Cas9 allow gene activation or genome editing with an external trigger such as light or small molecules. These include photoactivatable CRISPR systems developed by fusing light-responsive protein partners with an activator domain and a dCas9 for gene activation, or fusing similar light responsive domains with two constructs of split-Cas9, or by incorporating caged unnatural amino acids into Cas9, or by modifying the guide RNAs with photocleavable complements for genome editing. Methods to control genome editing with small molecules include an allosteric Cas9, with no detectable background editing, that will activate binding and cleavage upon the addition of 4-hydroxytamoxifen (4-HT), 4-HT responsive intein-linked Cas9s or a Cas9 that is 4-HT responsive when fused to four ERT2 domains. Intein-inducible split-Cas9 allows dimerization of Cas9 fragments and Rapamycin-inducible split-Cas9 system developed by fusing two constructs of split Cas9 with FRB and FKBP fragments. Furthermore, other studies have shown to induce transcription of Cas9 with a small molecule, doxycyline. Small molecules can also be used to improve Homology Directed Repair (HDR), often by inhibiting the Non-Homologous End Joining (NHEJ) pathway. These systems allow conditional control of CRISPR activity for improved precision, efficiency and spatiotemporal control. In 2017, researchers successfully used CRISPR-Cas9 as a treatment in a mouse model of human genetic deafness, by genetically editing the DNA in some cells in the ears of live mice. A dead Cas9 protein coupled with epigenetic modifiers which are used to repress certain genome sequences rather than cutting it all together. Using "dead" versions of Cas9 (dCas9) eliminates CRISPR's DNA-cutting ability, while preserving its ability to target desirable sequences. Multiple groups added various regulatory factors to dCas9s, enabling them to turn almost any gene on or off or adjust its level of activity. Like RNAi, CRISPR interference (CRISPRi) turns off genes in a reversible fashion by targeting, but not cutting a site. The targeted site is methylated, epigenetically modifying the gene. This modification inhibits transcription. These precisely placed modifications may then be used to regulate the effects on gene expressions and DNA dynamics after the inhibition of certain genome sequences within DNA. Within the past few years, epigenetic marks in different human cells have been closely researched and certain patterns within the marks have been found to correlate with everything ranging from tumor growth to brain activity. Conversely, CRISPR-mediated activation (CRISPRa) promotes gene transcription. Cas9 is an effective way of targeting and silencing specific genes at the DNA level. In bacteria, the presence of Cas9 alone is enough to block transcription. For mammalian applications, a section of protein is added. Its guide RNA targets regulatory DNA sequences called promoters that immediately precede the target gene. 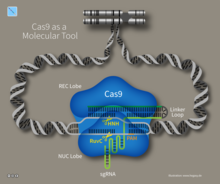 Cas9 was used to carry synthetic transcription factors that activated specific human genes. The technique achieved a strong effect by targeting multiple CRISPR constructs to slightly different locations on the gene's promoter. In 2016 researchers demonstrated that CRISPR from an ordinary mouth bacterium could be used to edit RNA. The researchers searched databases containing hundreds of millions of genetic sequences for those that resembled Crispr genes. They considered the fusobacteria Leptotrichia shahii. It had a group of genes that resembled CRISPR genes, but with important differences. When the researchers equipped other bacteria with these genes, which they called C2c2, they found that the organisms gained a novel defense. Many viruses encode their genetic information in RNA rather than DNA that they repurpose to make new viruses. HIV and poliovirus are such viruses. Bacteria with C2c2 make molecules that can dismember RNA, destroying the virus. Tailoring these genes opened any RNA molecule to editing. CRISPR-Cas systems can also be employed for editing of micro-RNA and long-noncoding RNA genes in plants. CRISPR simplifies creation of animals for research that mimic disease or show what happens when a gene is knocked down or mutated. CRISPR may be used at the germline level to create animals where the gene is changed everywhere, or it may be targeted at non-germline cells. CRISPR can be utilized to create human cellular models of disease. For instance, applied to human pluripotent stem cells CRISPR introduced targeted mutations in genes relevant to polycystic kidney disease (PKD) and focal segmental glomerulosclerosis (FSGS). These CRISPR-modified pluripotent stem cells were subsequently grown into human kidney organoids that exhibited disease-specific phenotypes. Kidney organoids from stem cells with PKD mutations formed large, translucent cyst structures from kidney tubules. The cysts were capable of reaching macroscopic dimensions, up to one centimeter in diameter. Kidney organoids with mutations in a gene linked to FSGS developed junctional defects between podocytes, the filtering cells affected in that disease. This was traced to the inability of podocytes ability to form microvilli between adjacent cells. Importantly, these disease phenotypes were absent in control organoids of identical genetic background, but lacking the CRISPR modifications. A similar approach was taken to model long QT syndrome in cardiomyocytes derived from pluripotent stem cells. These CRISPR-generated cellular models, with isogenic controls, provide a new way to study human disease and test drugs. Gene drives may provide a powerful tool to restore balance of ecosystems by eliminating invasive species. Concerns regarding efficacy, unintended consequences in the target species as well as non-target species have been raised particularly in the potential for accidental release from laboratories into the wild. Scientists have proposed several safeguards for ensuring the containment of experimental gene drives including molecular, reproductive, and ecological. Many recommend that immunization and reversal drives be developed in tandem with gene drives in order to overwrite their effects if necessary. There remains consensus that long-term effects must be studied more thoroughly particularly in the potential for ecological disruption that cannot be corrected with reversal drives. CRISPR/Cas-based "RNA-guided nucleases" can be used to target virulence factors, genes encoding antibiotic resistance and other medically relevant sequences of interest. This technology thus represents a novel form of antimicrobial therapy and a strategy by which to manipulate bacterial populations. Recent studies suggested a correlation between the interfering of the CRISPR/Cas locus and acquisition of antibiotic resistance This system provides protection of bacteria against invading foreign DNA, such as transposons, bacteriophages and plasmids. This system was shown to be a strong selective pressure for the acquisition of antibiotic resistance and virulence factor in bacterial pathogens. Some of the affected genes are tied to human diseases, including those involved in muscle differentiation, cancer, inflammation and fetal hemoglobin. Research suggests that CRISPR is an effective way to limit replication of multiple herpesviruses. It was able to eradicate viral DNA in the case of Epstein-Barr virus (EBV). Anti-herpesvirus CRISPRs have promising applications such as removing cancer-causing EBV from tumor cells, helping rid donated organs for immunocompromised patients of viral invaders, or preventing cold sore outbreaks and recurrent eye infections by blocking HSV-1 reactivation. As of August 2016, these were awaiting testing. CRISPR is being applied to develop tissue-based treatments for cancer and other diseases. CRISPR may revive the concept of transplanting animal organs into people. Retroviruses present in animal genomes could harm transplant recipients. In 2015 a team eliminated 62 copies of a retrovirus's DNA from the pig genome in a kidney epithelial cell. Researchers recently demonstrated the ability to birth live pig specimens after removing these retroviruses from their genome using CRISPR for the first time. CRISPR may have applications in tissue engineering and regenerative medicine, such as by creating human blood vessels that lack expression of MHC class II proteins, which often cause transplant rejection. As of 2016 CRISPR had been studied in animal models and cancer cell lines, to learn if it can be used to repair or thwart mutated genes that cause cancer. The first clinical trial involving CRISPR started in 2016. It involved removing immune cells from people with lung cancer, using CRISPR to edit out the gene expressed PD-1, then administrating the altered cells back to the same person. 20 other trials were under way or nearly ready, mostly in China, as of 2017. In 2016 the United States Food and Drug Administration (FDA) approved a clinical trial in which CRISPR would be used to alter T cells extracted from people with different kinds of cancer and then administer those engineered T cells back to the same people. In 2015, multiple studies attempted to systematically disable each individual human gene, in an attempt to identify which genes were essential to human biology. Between 1,600 and 1,800 genes passed this test—of the 20,000 or so known human genes. Such genes are more strongly activated, and unlikely to carry disabling mutations. They are more likely to have indispensable counterparts in other species. They build proteins that unite to form larger collaborative complexes. The studies also cataloged the essential genes in four cancer-cell lines and identified genes that are expendable in healthy cells, but crucial in specific tumor types and drugs that could target these rogue genes. The specific functions of some 18 percent of the essential genes are unidentified. In one 2015 targeting experiment, disabling individual genes in groups of cells attempted to identify those involved in resistance to a melanoma drug. Each such gene manipulation is itself a separate "drug", potentially opening the entire genome to CRISPR-based regulation. In 2016-2017, a CRISPR/Cas-based approach to genetically engineering adult rodent brains in vivo was successfully demonstrated. Unenriched sequencing libraries often have abundant undesired sequences. Cas9 can specifically deplete the undesired sequences with double strand breakage with up to 99% efficiency and without significant off-target effects as seen with restriction enzymes. Treatment with Cas9 can deplete abundant rRNA while increasing pathogen sensitivity in RNA-seq libraries. CRISPR/Cas-9 can be used to edit the DNA of organisms in vivo and entire chromosomes can be eliminated from an organism at any point in its development. Chromosomes that have been deleted in vivo are the Y chromosomes and X chromosomes of adult lab mice and human chromosomes 14 and 21, in embryonic stem cell lines and aneuploid mice respectively. This method might be useful for treating genetic aneuploid diseases such as Down Syndrome and intersex disorders. As of December 2014, patent rights to CRISPR were contested. Several companies formed to develop related drugs and research tools. As companies ramp up financing, doubts as to whether CRISPR can be quickly monetized were raised. In February 2017 the US Patent Office ruled on a patent interference case brought by University of California with respect to patents issued to the Broad Institute, and found that the Broad patents, with claims covering the application of CRISPR/cas9 in eukaryotic cells, were distinct from the inventions claimed by University of California. Shortly after, University of California filed an appeal of this ruling. As of November 2013, SAGE Labs (part of Horizon Discovery group) had exclusive rights from one of those companies to produce and sell genetically engineered rats and non-exclusive rights for mouse and rabbit models. By 2015[update], Thermo Fisher Scientific had licensed intellectual property from ToolGen to develop CRISPR reagent kits. In March 2017, the European Patent Office (EPO) announced its intention to allow claims to Max-Planck Institute in Berlin, University of California, and University of Vienna, and in August 2017, the EPO announced its intention to allow CRISPR claims in a patent application that MilliporeSigma had filed. As of August 2017 the patent situation in Europe was complex, with MilliporeSigma, ToolGen, Vilnius University, and Harvard contending for claims, along with University of California and Broad. On Jan 21, 2018, The Wall Street Journal reported that 86 people in China have had their genes edited using CRISPR. At least four labs in the US, labs in China and the UK, and a US biotechnology company called Ovascience announced plans for ongoing research to apply CRISPR to human embryos. Scientists, including a CRISPR co-inventor, urged a worldwide moratorium on applying CRISPR to the human germline, especially for clinical use. They said "scientists should avoid even attempting, in lax jurisdictions, germline genome modification for clinical application in humans" until the full implications "are discussed among scientific and governmental organizations". These scientists support basic research on CRISPR and do not see CRISPR as developed enough for any clinical use in making heritable changes to humans. In April 2015, Chinese scientists reported results of an attempt to alter the DNA of non-viable human embryos using CRISPR to correct a mutation that causes beta thalassemia, a lethal heritable disorder. The study had previously been rejected by both Nature and Science in part because of ethical concerns. The experiments resulted in changing only some genes, and had off-target effects on other genes. The researchers stated that CRISPR is not ready for clinical application in reproductive medicine. In April 2016 Chinese scientists were reported to have made a second unsuccessful attempt to alter the DNA of non-viable human embryos using CRISPR - this time to alter the CCR5 gene to make the embryo HIV resistant. In December 2015, an International Summit on Human Gene Editing took place in Washington under the guidance of David Baltimore. Members of national scientific academies of America, Britain and China discussed the ethics of germline modification. They agreed to support basic and clinical research under appropriate legal and ethical guidelines. A specific distinction was made between somatic cells, where the effects of edits are limited to a single individual, versus germline cells, where genome changes could be inherited by future generations. Heritable modifications could have unintended and far-reaching consequences for human evolution, genetically (e.g. gene/environment interactions) and culturally (e.g. Social Darwinism). Altering of gametocytes and embryos to generate inheritable changes in humans was defined to be irresponsible. The group agreed to initiate an international forum to address such concerns and harmonize regulations across countries. Policy regulations for the CRISPR/cas9 system vary around the globe. In February 2016, British scientists were given permission by regulators to genetically modify human embryos by using CRISPR-Cas9 and related techniques. However, researchers were forbidden from implanting the embryos and the embryos were to be destroyed after seven days. The US has an elaborate, interdepartmental regulatory system to evaluate new genetically modified foods and crops. For example, the Agriculture Risk Protection Act of 2000 gives the USDA the authority to oversee the detection, control, eradication, suppression, prevention, or retardation of the spread of plant pests or noxious weeds to protect the agriculture, environment and economy of the US. The act regulates any genetically modified organism that utilizes the genome of a predefined 'plant pest' or any plant not previously categorized. In 2015, Yinong Yang successfully deactivated 16 specific genes in the white button mushroom. Since he had not added any foreign DNA to his organism, the mushroom could not be regulated by the USDA under Section 340.2. Yang's white button mushroom was the first organism genetically modified with the Crispr/cas9 protein system to pass US regulation. In 2016, the USDA sponsored a committee to consider future regulatory policy for upcoming genetic modification techniques. With the help of the US National Academies of Sciences, Engineering and Medicine, special interests groups met on April 15 to contemplate the possible advancements in genetic engineering within the next 5 years and potential policy regulations that would need to come into play. With the emergence of rogue genetic engineers employing the technology, the FDA has begun issuing new regulations. In China, where social conditions sharply contrast with the west, genetic diseases carry a heavy stigma, individuals with mental and physical disabilities get little government support. Furthermore, there are no religious barriers for the use of genetic modifications to change the genotypes of people. This leaves China with fewer policy barriers to the use of this technology. In 2012 and 2013, CRISPR was a runner-up in Science Magazine's Breakthrough of the Year award. In 2015, it was the winner of that award. CRISPR was named as one of MIT Technology Review's 10 breakthrough technologies in 2014 and 2016. In 2016, Jennifer Doudna, Emmanuelle Charpentier, along with Rudolph Barrangou, Philippe Horvath, and Feng Zhang won the Gairdner International award. In 2017, Jennifer Doudna and Emmanuelle Charpentier were awarded the Japan Prize for their revolutionary invention of CRISPR-Cas9 in Tokyo, Japan. In 2016, Emmanuelle Charpentier, Jennifer Doudna, and Feng Zhang won the Tang Prize in Biopharmaceutical Science. CRISPR-DR2: Secondary structure taken from the Rfam database. Family RF01315. CRISPR-DR5: Secondary structure taken from the Rfam database. Family RF011318. CRISPR-DR6: Secondary structure taken from the Rfam database. Family RF01319. CRISPR-DR8: Secondary structure taken from the Rfam database. Family RF01321. CRISPR-DR9: Secondary structure taken from the Rfam database. Family RF01322. CRISPR-DR19: Secondary structure taken from the Rfam database. Family RF01332. CRISPR-DR41: Secondary structure taken from the Rfam database. Family RF01350. CRISPR-DR52: Secondary structure taken from the Rfam database. Family RF01365. CRISPR-DR57: Secondary structure taken from the Rfam database. Family RF01370. CRISPR-DR65: Secondary structure taken from the Rfam database. Family RF01378. ^ a b Barrangou R (2015). "The roles of CRISPR-Cas systems in adaptive immunity and beyond". Current Opinion in Immunology. 32: 36–41. doi:10.1016/j.coi.2014.12.008. PMID 25574773. ^ Zhang F, Wen Y, Guo X (2014). "CRISPR/Cas9 for genome editing: progress, implications and challenges". Human Molecular Genetics. 23 (R1): R40–6. doi:10.1093/hmg/ddu125. PMID 24651067. ^ Sawyer E (9 February 2013). "Editing Genomes with the Bacterial Immune System". Scitable. Nature Publishing Group. Retrieved 6 April 2015. ^ a b c Marraffini LA, Sontheimer EJ (March 2010). "CRISPR interference: RNA-directed adaptive immunity in bacteria and archaea". Nature Reviews Genetics. 11 (3): 181–90. doi:10.1038/nrg2749. PMC 2928866  . PMID 20125085. ^ a b Mojica FJ, Díez-Villaseñor C, Soria E, Juez G (April 2000). "Biological significance of a family of regularly spaced repeats in the genomes of Archaea, Bacteria and mitochondria". Molecular Microbiology. 36 (1): 244–6. doi:10.1046/j.1365-2958.2000.01838.x  . PMID 10760181. ^ Redman M, King A, Watson C, King D (August 2016). "What is CRISPR/Cas9?". Archives of Disease in Childhood. Education and Practice Edition. 101 (4): 213–5. doi:10.1136/archdischild-2016-310459. PMC 4975809  . PMID 27059283. ^ a b Marraffini LA, Sontheimer EJ (December 2008). "CRISPR interference limits horizontal gene transfer in staphylococci by targeting DNA". Science. 322 (5909): 1843–5. Bibcode:2008Sci...322.1843M. doi:10.1126/science.1165771. PMC 2695655  . PMID 19095942. ^ Mohanraju P, Makarova KS, Zetsche B, Zhang F, Koonin EV, van der Oost J (2016). "Diverse evolutionary roots and mechanistic variations of the CRISPR-Cas systems". Science. 353 (6299): aad5147. doi:10.1126/science.aad5147. PMID 27493190. ^ Hille F, Richter H, Wong SP, Bratovič M, Ressel S, Charpentier E (March 2018). "The Biology of CRISPR-Cas: Backward and Forward". Cell. 172 (6): 1239–1259. doi:10.1016/j.cell.2017.11.032. PMID 29522745. ^ a b Ledford H (2015). "CRISPR, the disruptor". Nature. 522 (7554): 20–4. Bibcode:2015Natur.522...20L. doi:10.1038/522020a. PMID 26040877. ^ a b Snyder B (21 August 2014). "New technique accelerates genome editing process". research news @ Vanderbilt. Nashville, Tennessee: Vanderbilt University. ^ a b Hendel A, Bak RO, Clark JT, Kennedy AB, Ryan DE, Roy S, Steinfeld I, Lunstad BD, Kaiser RJ, Wilkens AB, Bacchetta R, Tsalenko A, Dellinger D, Bruhn L, Porteus MH (September 2015). "Chemically modified guide RNAs enhance CRISPR-Cas genome editing in human primary cells". Nature Biotechnology. 33 (9): 985–9. doi:10.1038/nbt.3290. PMC 4729442  . PMID 26121415. ^ a b c Horvath P, Barrangou R (January 2010). "CRISPR/Cas, the immune system of bacteria and archaea". Science. 327 (5962): 167–70. Bibcode:2010Sci...327..167H. doi:10.1126/Science.1179555. PMID 20056882. ^ Ledford H (March 2016). "CRISPR: gene editing is just the beginning". Nature. 531 (7593): 156–9. Bibcode:2016Natur.531..156L. doi:10.1038/531156a. PMID 26961639. ^ Maxmen A (August 2015). "The Genesis Engine". WIRED. Retrieved 2016-06-05. ^ Travis J (17 December 2015). "Breakthrough of the Year: CRISPR makes the cut". Science Magazine. American Association for the Advancement of Science. ^ Ledford H (June 2015). "CRISPR, the disruptor". Nature. 522 (7554): 20–4. Bibcode:2015Natur.522...20L. doi:10.1038/522020a. PMID 26040877. ^ Ishino Y, Shinagawa H, Makino K, Amemura M, Nakata A (December 1987). "Nucleotide sequence of the iap gene, responsible for alkaline phosphatase isozyme conversion in Escherichia coli, and identification of the gene product". Journal of Bacteriology. 169 (12): 5429–33. PMC 213968  . PMID 3316184. ^ a b c d Hsu PD, Lander ES, Zhang F (June 2014). "Development and applications of CRISPR-Cas9 for genome engineering". Cell. 157 (6): 1262–78. doi:10.1016/j.cell.2014.05.010. PMC 4343198  . PMID 24906146. ^ van Soolingen D, de Haas PE, Hermans PW, Groenen PM, van Embden JD (August 1993). "Comparison of various repetitive DNA elements as genetic markers for strain differentiation and epidemiology of Mycobacterium tuberculosis". Journal of Clinical Microbiology. 31 (8): 1987–95. PMC 265684  . PMID 7690367. ^ Groenen PM, Bunschoten AE, van Soolingen D, van Embden JD (December 1993). "Nature of DNA polymorphism in the direct repeat cluster of Mycobacterium tuberculosis; application for strain differentiation by a novel typing method". Molecular Microbiology. 10 (5): 1057–65. doi:10.1111/j.1365-2958.1993.tb00976.x. PMID 7934856. ^ a b c Mojica FJ, Montoliu L (2016). "On the Origin of CRISPR-Cas Technology: From Prokaryotes to Mammals". Trends in Microbiology. 24 (10): 811–20. doi:10.1016/j.tim.2016.06.005. PMID 27401123. ^ a b Mojica FJ, Rodriguez-Valera F (2016). "The discovery of CRISPR in archaea and bacteria". The FEBS Journal. 283 (17): 3162–9. doi:10.1111/febs.13766. PMID 27234458. ^ Barrangou R, van der Oost J (2013). CRISPR-Cas Systems : RNA-mediated Adaptive Immunity in Bacteria and Archaea. Heidelberg: Springer. p. 6. ISBN 978-3-642-34656-9. ^ Charpentier E, Richter H, van der Oost J, White MF (May 2015). "Biogenesis pathways of RNA guides in archaeal and bacterial CRISPR-Cas adaptive immunity". FEMS Microbiology Reviews. 39 (3): 428–41. doi:10.1093/femsre/fuv023. PMC 5965381  . PMID 25994611. ^ Jansen R, Embden JD, Gaastra W, Schouls LM (March 2002). "Identification of genes that are associated with DNA repeats in prokaryotes". Molecular Microbiology. 43 (6): 1565–75. doi:10.1046/j.1365-2958.2002.02839.x. PMID 11952905. ^ Grissa I, Vergnaud G, Pourcel C (May 2007). "The CRISPRdb database and tools to display CRISPRs and to generate dictionaries of spacers and repeats". BMC Bioinformatics. 8: 172. doi:10.1186/1471-2105-8-172. PMC 1892036  . PMID 17521438. ^ a b Pourcel C, Salvignol G, Vergnaud G (March 2005). "CRISPR elements in Yersinia pestis acquire new repeats by preferential uptake of bacteriophage DNA, and provide additional tools for evolutionary studies". Microbiology. 151 (Pt 3): 653–63. doi:10.1099/mic.0.27437-0. PMID 15758212. ^ a b Mojica FJ, Díez-Villaseñor C, García-Martínez J, Soria E (February 2005). "Intervening sequences of regularly spaced prokaryotic repeats derive from foreign genetic elements". Journal of Molecular Evolution. 60 (2): 174–82. Bibcode:2005JMolE..60..174M. doi:10.1007/s00239-004-0046-3. PMID 15791728. ^ a b Bolotin A, Quinquis B, Sorokin A, Ehrlich SD (August 2005). "Clustered regularly interspaced short palindrome repeats (CRISPRs) have spacers of extrachromosomal origin". Microbiology. 151 (Pt 8): 2551–61. doi:10.1099/mic.0.28048-0  . PMID 16079334. ^ Morange M (June 2015). "What history tells us XXXVII. CRISPR-Cas: The discovery of an immune system in prokaryotes". Journal of Biosciences. 40 (2): 221–3. doi:10.1007/s12038-015-9532-6. PMID 25963251. ^ Lander ES (January 2016). "The Heroes of CRISPR". Cell. 164 (1–2): 18–28. doi:10.1016/j.cell.2015.12.041. PMID 26771483. ^ Makarova KS, Grishin NV, Shabalina SA, Wolf YI, Koonin EV (March 2006). "A putative RNA-interference-based immune system in prokaryotes: computational analysis of the predicted enzymatic machinery, functional analogies with eukaryotic RNAi, and hypothetical mechanisms of action". Biology Direct. 1: 7. doi:10.1186/1745-6150-1-7. PMC 1462988  . PMID 16545108. ^ a b c Marraffini LA (October 2015). "CRISPR-Cas immunity in prokaryotes". Nature. 526 (7571): 55–61. Bibcode:2015Natur.526...55M. doi:10.1038/nature15386. PMID 26432244. ^ a b c d e Pennisi E (August 2013). "The CRISPR craze". News Focus. Science. 341 (6148): 833–6. doi:10.1126/science.341.6148.833. PMID 23970676. ^ Brouns SJ, Jore MM, Lundgren M, Westra ER, Slijkhuis RJ, Snijders AP, Dickman MJ, Makarova KS, Koonin EV, van der Oost J (August 2008). "Small CRISPR RNAs guide antiviral defense in prokaryotes". Science. 321 (5891): 960–4. Bibcode:2008Sci...321..960B. doi:10.1126/science.1159689. PMC 5898235  . PMID 18703739. ^ a b Garneau JE, Dupuis MÈ, Villion M, Romero DA, Barrangou R, Boyaval P, et al. (November 2010). "The CRISPR/Cas bacterial immune system cleaves bacteriophage and plasmid DNA". Nature. 468 (7320): 67–71. Bibcode:2010Natur.468...67G. doi:10.1038/nature09523. PMID 21048762. ^ Barrangou R (November 2015). "Diversity of CRISPR-Cas immune systems and molecular machines". Genome Biology. 16: 247. doi:10.1186/s13059-015-0816-9. PMC 4638107  . PMID 26549499. ^ a b Jinek M, Chylinski K, Fonfara I, Hauer M, Doudna JA, Charpentier E (August 2012). "A programmable dual-RNA-guided DNA endonuclease in adaptive bacterial immunity". Science. 337 (6096): 816–21. Bibcode:2012Sci...337..816J. doi:10.1126/science.1225829. PMID 22745249. ^ Cong L, Ran FA, Cox D, Lin S, Barretto R, Habib N, Hsu PD, Wu X, Jiang W, Marraffini LA, Zhang F (February 2013). "Multiplex genome engineering using CRISPR/Cas systems". Science. 339 (6121): 819–23. Bibcode:2013Sci...339..819C. doi:10.1126/science.1231143. PMC 3795411  . PMID 23287718. ^ Mali P, Yang L, Esvelt KM, Aach J, Guell M, DiCarlo JE, Norville JE, Church GM (February 2013). "RNA-guided human genome engineering via Cas9". Science. 339 (6121): 823–6. Bibcode:2013Sci...339..823M. doi:10.1126/science.1232033. PMC 3712628  . PMID 23287722. ^ a b DiCarlo JE, Norville JE, Mali P, Rios X, Aach J, Church GM (April 2013). "Genome engineering in Saccharomyces cerevisiae using CRISPR-Cas systems". Nucleic Acids Research. 41 (7): 4336–43. doi:10.1093/nar/gkt135. PMC 3627607  . PMID 23460208. ^ a b Zhang GC, Kong II, Kim H, Liu JJ, Cate JH, Jin YS (December 2014). "Construction of a quadruple auxotrophic mutant of an industrial polyploid saccharomyces cerevisiae strain by using RNA-guided Cas9 nuclease". Applied and Environmental Microbiology. 80 (24): 7694–701. doi:10.1128/AEM.02310-14. PMC 4249234  . PMID 25281382. ^ a b Liu JJ, Kong II, Zhang GC, Jayakody LN, Kim H, Xia PF, et al. (April 2016). "Metabolic Engineering of Probiotic Saccharomyces boulardii". Applied and Environmental Microbiology. 82 (8): 2280–7. doi:10.1128/AEM.00057-16. PMC 4959471  . PMID 26850302. ^ Vyas VK, Barrasa MI, Fink GR (2015). "A Candida albicans CRISPR system permits genetic engineering of essential genes and gene families". Science Advances. 1 (3): e1500248. Bibcode:2015SciA....1E0248V. doi:10.1126/sciadv.1500248. PMC 4428347  . PMID 25977940. ^ Ng H, Dean N (2017). "Dramatic Improvement of CRISPR/Cas9 Editing in Candida albicans by Increased Single Guide RNA Expression" (PDF). MSphere. 2 (2): e00385–16. doi:10.1128/mSphere.00385-16. PMC 5397569  . PMID 28435892. ^ Hwang WY, Fu Y, Reyon D, Maeder ML, Tsai SQ, Sander JD, et al. (March 2013). "Efficient genome editing in zebrafish using a CRISPR-Cas system". Nature Biotechnology. 31 (3): 227–9. doi:10.1038/nbt.2501. PMC 3686313  . PMID 23360964. ^ Gratz SJ, Cummings AM, Nguyen JN, Hamm DC, Donohue LK, Harrison MM, Wildonger J, O'Connor-Giles KM (August 2013). "Genome engineering of Drosophila with the CRISPR RNA-guided Cas9 nuclease". Genetics. 194 (4): 1029–35. doi:10.1534/genetics.113.152710. PMC 3730909  . PMID 23709638. ^ a b c Friedland AE, Tzur YB, Esvelt KM, Colaiácovo MP, Church GM, Calarco JA (August 2013). "Heritable genome editing in C. elegans via a CRISPR-Cas9 system". Nature Methods. 10 (8): 741–3. doi:10.1038/nmeth.2532. PMC 3822328  . PMID 23817069. ^ Jiang W, Zhou H, Bi H, Fromm M, Yang B, Weeks DP (November 2013). "Demonstration of CRISPR/Cas9/sgRNA-mediated targeted gene modification in Arabidopsis, tobacco, sorghum and rice". Nucleic Acids Research. 41 (20): e188. doi:10.1093/nar/gkt780. PMC 3814374  . PMID 23999092. ^ a b Wang H, Yang H, Shivalila CS, Dawlaty MM, Cheng AW, Zhang F, Jaenisch R (May 2013). "One-step generation of mice carrying mutations in multiple genes by CRISPR/Cas-mediated genome engineering". Cell. 153 (4): 910–8. doi:10.1016/j.cell.2013.04.025. PMC 3969854  . PMID 23643243. ^ Guo X, Li XJ (July 2015). "Targeted genome editing in primate embryos". Cell Research. 25 (7): 767–8. doi:10.1038/cr.2015.64. PMC 4493275  . PMID 26032266. ^ a b Baltimore D, Berg P, Botchan M, Carroll D, Charo RA, Church G, Corn JE, Daley GQ, Doudna JA, Fenner M, Greely HT, Jinek M, Martin GS, Penhoet E, Puck J, Sternberg SH, Weissman JS, Yamamoto KR (April 2015). "Biotechnology. A prudent path forward for genomic engineering and germline gene modification". Science. 348 (6230): 36–8. Bibcode:2015Sci...348...36B. doi:10.1126/science.aab1028. PMC 4394183  . PMID 25791083. ^ Larson MH, Gilbert LA, Wang X, Lim WA, Weissman JS, Qi LS (November 2013). "CRISPR interference (CRISPRi) for sequence-specific control of gene expression". Nature Protocols. 8 (11): 2180–96. doi:10.1038/nprot.2013.132. PMC 3922765  . PMID 24136345. ^ Liang P, Xu Y, Zhang X, Ding C, Huang R, Zhang Z, et al. (May 2015). "CRISPR/Cas9-mediated gene editing in human tripronuclear zygotes". Protein & cell. 6 (5): 363–372. doi:10.1007/s13238-015-0153-5. PMC 4417674  . PMID 25894090. ^ Zetsche B, Gootenberg JS, Abudayyeh OO, Slaymaker IM, Makarova KS, Essletzbichler P, et al. (October 2015). "Cpf1 is a single RNA-guided endonuclease of a class 2 CRISPR-Cas system". Cell. 163 (3): 759–71. doi:10.1016/j.cell.2015.09.038. PMC 4638220  . PMID 26422227. ^ Fonfara I, Richter H, Bratovič M, Le Rhun A, Charpentier E (April 2016). "The CRISPR-associated DNA-cleaving enzyme Cpf1 also processes precursor CRISPR RNA". Nature. 532 (7600): 517–21. Bibcode:2016Natur.532..517F. doi:10.1038/nature17945. PMID 27096362. ^ Kim H, Kim ST, Ryu J, Kang BC, Kim JS, and Kim SG (February 2017). "CRISPR/Cpf1-mediated DNA-free plant genome editing". Nature Communications. 8 (14406): 14406. Bibcode:2017NatCo...814406K. doi:10.1038/ncomms14406. PMC 5316869  . PMID 28205546. ^ "Cpf1 Nuclease". abmgood.com. Retrieved 2017-12-14. ^ Hille F, Charpentier E (November 2016). "CRISPR-Cas: biology, mechanisms and relevance". Philosophical Transactions of the Royal Society of London. Series B, Biological Sciences. 371 (1707): 20150496. doi:10.1098/rstb.2015.0496. PMC 5052741  . PMID 27672148. ^ a b c Barrangou R, Marraffini LA (April 2014). "CRISPR-Cas systems: Prokaryotes upgrade to adaptive immunity". Molecular Cell. 54 (2): 234–44. doi:10.1016/j.molcel.2014.03.011. PMC 4025954  . PMID 24766887. ^ a b c Tyson GW, Banfield JF (January 2008). "Rapidly evolving CRISPRs implicated in acquired resistance of microorganisms to viruses". Environmental Microbiology. 10 (1): 200–7. doi:10.1111/j.1462-2920.2007.01444.x. PMID 17894817. ^ a b c d e f g h i Makarova KS, Wolf YI, Alkhnbashi OS, Costa F, Shah SA, Saunders SJ, et al. (November 2015). "An updated evolutionary classification of CRISPR-Cas systems". Nature Reviews. Microbiology. 13 (11): 722–36. doi:10.1038/nrmicro3569. PMC 5426118  . PMID 26411297. ^ a b c Wright AV, Nuñez JK, Doudna JA (January 2016). "Biology and Applications of CRISPR Systems: Harnessing Nature's Toolbox for Genome Engineering". Cell. 164 (1–2): 29–44. doi:10.1016/j.cell.2015.12.035. PMID 26771484. ^ Westra ER, Dowling AJ, Broniewski JM, van Houte S (November 2016). "Evolution and Ecology of CRISPR". Annual Review of Ecology, Evolution, and Systematics. 47 (1): 307–331. doi:10.1146/annurev-ecolsys-121415-032428. ^ a b c Wiedenheft B, Sternberg SH, Doudna JA (February 2012). "RNA-guided genetic silencing systems in bacteria and archaea". Nature. 482 (7385): 331–8. Bibcode:2012Natur.482..331W. doi:10.1038/nature10886. PMID 22337052. ^ a b Deng L, Garrett RA, Shah SA, Peng X, She Q (March 2013). "A novel interference mechanism by a type IIIB CRISPR-Cmr module in Sulfolobus". Molecular Microbiology. 87 (5): 1088–99. doi:10.1111/mmi.12152  . PMID 23320564. ^ Sinkunas T, Gasiunas G, Fremaux C, Barrangou R, Horvath P, Siksnys V (April 2011). "Cas3 is a single-stranded DNA nuclease and ATP-dependent helicase in the CRISPR/Cas immune system". The EMBO Journal. 30 (7): 1335–42. doi:10.1038/emboj.2011.41. PMC 3094125  . PMID 21343909. ^ Huo Y, Nam KH, Ding F, Lee H, Wu L, Xiao Y, Farchione MD, Zhou S, Rajashankar K, Kurinov I, Zhang R, Ke A (September 2014). "Structures of CRISPR Cas3 offer mechanistic insights into Cascade-activated DNA unwinding and degradation". Nature Structural & Molecular Biology. 21 (9): 771–7. doi:10.1038/nsmb.2875. PMC 4156918  . PMID 25132177. ^ a b Chylinski K, Makarova KS, Charpentier E, Koonin EV (June 2014). "Classification and evolution of type II CRISPR-Cas systems". Nucleic Acids Research. 42 (10): 6091–105. doi:10.1093/nar/gku241. PMC 4041416  . PMID 24728998. ^ a b Makarova KS, Aravind L, Wolf YI, Koonin EV (July 2011). "Unification of Cas protein families and a simple scenario for the origin and evolution of CRISPR-Cas systems". Biology Direct. 6: 38. doi:10.1186/1745-6150-6-38. PMC 3150331  . PMID 21756346. ^ a b c d Gasiunas G, Barrangou R, Horvath P, Siksnys V (September 2012). "Cas9-crRNA ribonucleoprotein complex mediates specific DNA cleavage for adaptive immunity in bacteria". Proceedings of the National Academy of Sciences of the United States of America. 109 (39): E2579–86. Bibcode:2012PNAS..109E2579G. doi:10.1073/pnas.1208507109. PMC 3465414  . PMID 22949671. ^ Heler R, Samai P, Modell JW, Weiner C, Goldberg GW, Bikard D, Marraffini LA (March 2015). "Cas9 specifies functional viral targets during CRISPR-Cas adaptation". Nature. 519 (7542): 199–202. Bibcode:2015Natur.519..199H. doi:10.1038/nature14245. PMC 4385744  . PMID 25707807. ^ Nam KH, Kurinov I, Ke A (September 2011). "Crystal structure of clustered regularly interspaced short palindromic repeats (CRISPR)-associated Csn2 protein revealed Ca2+-dependent double-stranded DNA binding activity". The Journal of Biological Chemistry. 286 (35): 30759–68. doi:10.1074/jbc.M111.256263. PMC 3162437  . PMID 21697083. ^ Chylinski K, Le Rhun A, Charpentier E (May 2013). "The tracrRNA and Cas9 families of type II CRISPR-Cas immunity systems". RNA Biology. 10 (5): 726–37. doi:10.4161/rna.24321. PMC 3737331  . PMID 23563642. ^ Cox DB, Gootenberg JS, Abudayyeh OO, Franklin B, Kellner MJ, Joung J, Zhang F (November 2017). "RNA editing with CRISPR-Cas13". Science. 358 (6366): 1019–1027. Bibcode:2017Sci...358.1019C. doi:10.1126/science.aaq0180. PMC 5793859  . PMID 29070703. ^ a b Aliyari R, Ding SW (January 2009). "RNA-based viral immunity initiated by the Dicer family of host immune receptors". Immunological Reviews. 227 (1): 176–88. doi:10.1111/j.1600-065X.2008.00722.x. PMC 2676720  . PMID 19120484. ^ a b Dugar G, Herbig A, Förstner KU, Heidrich N, Reinhardt R, Nieselt K, Sharma CM (May 2013). "High-resolution transcriptome maps reveal strain-specific regulatory features of multiple Campylobacter jejuni isolates". PLoS Genetics. 9 (5): e1003495. doi:10.1371/journal.pgen.1003495. PMC 3656092  . PMID 23696746. ^ Hatoum-Aslan A, Maniv I, Marraffini LA (December 2011). "Mature clustered, regularly interspaced, short palindromic repeats RNA (crRNA) length is measured by a ruler mechanism anchored at the precursor processing site". Proceedings of the National Academy of Sciences of the United States of America. 108 (52): 21218–22. Bibcode:2011PNAS..10821218H. doi:10.1073/pnas.1112832108. PMC 3248500  . PMID 22160698. ^ a b Yosef I, Goren MG, Qimron U (July 2012). "Proteins and DNA elements essential for the CRISPR adaptation process in Escherichia coli". Nucleic Acids Research. 40 (12): 5569–76. doi:10.1093/nar/gks216. PMC 3384332  . PMID 22402487. ^ a b c d Swarts DC, Mosterd C, van Passel MW, Brouns SJ (2012). "CRISPR interference directs strand specific spacer acquisition". PLOS One. 7 (4): e35888. Bibcode:2012PLoSO...735888S. doi:10.1371/journal.pone.0035888. PMC 3338789  . PMID 22558257. ^ Babu M, Beloglazova N, Flick R, Graham C, Skarina T, Nocek B, et al. (January 2011). "A dual function of the CRISPR-Cas system in bacterial antivirus immunity and DNA repair". Molecular Microbiology. 79 (2): 484–502. doi:10.1111/j.1365-2958.2010.07465.x. PMC 3071548  . PMID 21219465. ^ Han D, Lehmann K, Krauss G (June 2009). "SSO1450--a CAS1 protein from Sulfolobus solfataricus P2 with high affinity for RNA and DNA". FEBS Letters. 583 (12): 1928–32. doi:10.1016/j.febslet.2009.04.047. PMID 19427858. ^ Wiedenheft B, Zhou K, Jinek M, Coyle SM, Ma W, Doudna JA (June 2009). "Structural basis for DNase activity of a conserved protein implicated in CRISPR-mediated genome defense". Structure. 17 (6): 904–12. doi:10.1016/j.str.2009.03.019. PMID 19523907. ^ Beloglazova N, Brown G, Zimmerman MD, Proudfoot M, Makarova KS, Kudritska M, et al. (July 2008). "A novel family of sequence-specific endoribonucleases associated with the clustered regularly interspaced short palindromic repeats". The Journal of Biological Chemistry. 283 (29): 20361–71. doi:10.1074/jbc.M803225200. PMC 2459268  . PMID 18482976. ^ Samai P, Smith P, Shuman S (December 2010). "Structure of a CRISPR-associated protein Cas2 from Desulfovibrio vulgaris". Acta Crystallographica Section F. 66 (Pt 12): 1552–6. doi:10.1107/S1744309110039801. PMC 2998353  . PMID 21139194. ^ Nam KH, Ding F, Haitjema C, Huang Q, DeLisa MP, Ke A (October 2012). "Double-stranded endonuclease activity in Bacillus halodurans clustered regularly interspaced short palindromic repeats (CRISPR)-associated Cas2 protein". The Journal of Biological Chemistry. 287 (43): 35943–52. doi:10.1074/jbc.M112.382598. PMC 3476262  . PMID 22942283. ^ a b Nuñez JK, Kranzusch PJ, Noeske J, Wright AV, Davies CW, Doudna JA (June 2014). "Cas1-Cas2 complex formation mediates spacer acquisition during CRISPR-Cas adaptive immunity". Nature Structural & Molecular Biology. 21 (6): 528–34. doi:10.1038/nsmb.2820. PMC 4075942  . PMID 24793649. ^ Nuñez JK, Lee AS, Engelman A, Doudna JA (March 2015). "Integrase-mediated spacer acquisition during CRISPR-Cas adaptive immunity". Nature. 519 (7542): 193–8. Bibcode:2015Natur.519..193N. doi:10.1038/nature14237. PMC 4359072  . PMID 25707795. ^ Wang J, Li J, Zhao H, Sheng G, Wang M, Yin M, Wang Y (November 2015). "Structural and Mechanistic Basis of PAM-Dependent Spacer Acquisition in CRISPR-Cas Systems". Cell. 163 (4): 840–53. doi:10.1016/j.cell.2015.10.008. PMID 26478180. ^ Nuñez JK, Harrington LB, Kranzusch PJ, Engelman AN, Doudna JA (November 2015). "Foreign DNA capture during CRISPR-Cas adaptive immunity". Nature. 527 (7579): 535–8. Bibcode:2015Natur.527..535N. doi:10.1038/nature15760. PMC 4662619  . PMID 26503043. ^ Sorek R, Lawrence CM, Wiedenheft B (2013). "CRISPR-mediated adaptive immune systems in bacteria and archaea". Annual Review of Biochemistry. 82 (1): 237–66. doi:10.1146/annurev-biochem-072911-172315. PMID 23495939. ^ Nuñez JK, Bai L, Harrington LB, Hinder TL, Doudna JA (June 2016). "CRISPR Immunological Memory Requires a Host Factor for Specificity". Molecular Cell. 62 (6): 824–833. doi:10.1016/j.molcel.2016.04.027. PMID 27211867. ^ a b c d Horvath P, Romero DA, Coûté-Monvoisin AC, Richards M, Deveau H, Moineau S, et al. (February 2008). "Diversity, activity, and evolution of CRISPR loci in Streptococcus thermophilus". Journal of Bacteriology. 190 (4): 1401–12. doi:10.1128/JB.01415-07. PMC 2238196  . PMID 18065539. ^ a b c Deveau H, Barrangou R, Garneau JE, Labonté J, Fremaux C, Boyaval P, Romero DA, Horvath P, Moineau S (February 2008). "Phage response to CRISPR-encoded resistance in Streptococcus thermophilus". Journal of Bacteriology. 190 (4): 1390–400. doi:10.1128/JB.01412-07. PMC 2238228  . PMID 18065545. ^ Mojica FJ, Díez-Villaseñor C, García-Martínez J, Almendros C (March 2009). "Short motif sequences determine the targets of the prokaryotic CRISPR defence system". Microbiology. 155 (Pt 3): 733–40. doi:10.1099/mic.0.023960-0. PMID 19246744. ^ a b Lillestøl RK, Shah SA, Brügger K, Redder P, Phan H, Christiansen J, Garrett RA (April 2009). "CRISPR families of the crenarchaeal genus Sulfolobus: bidirectional transcription and dynamic properties". Molecular Microbiology. 72 (1): 259–72. doi:10.1111/j.1365-2958.2009.06641.x. PMID 19239620. ^ a b Shah SA, Hansen NR, Garrett RA (February 2009). "Distribution of CRISPR spacer matches in viruses and plasmids of crenarchaeal acidothermophiles and implications for their inhibitory mechanism". Biochemical Society Transactions. 37 (Pt 1): 23–8. doi:10.1042/BST0370023. PMID 19143596. ^ a b Díez-Villaseñor C, Guzmán NM, Almendros C, García-Martínez J, Mojica FJ (May 2013). "CRISPR-spacer integration reporter plasmids reveal distinct genuine acquisition specificities among CRISPR-Cas I-E variants of Escherichia coli". RNA Biology. 10 (5): 792–802. doi:10.4161/rna.24023. PMC 3737337  . PMID 23445770. ^ a b c Erdmann S, Garrett RA (September 2012). "Selective and hyperactive uptake of foreign DNA by adaptive immune systems of an archaeon via two distinct mechanisms". Molecular Microbiology. 85 (6): 1044–56. doi:10.1111/j.1365-2958.2012.08171.x. PMC 3468723  . PMID 22834906. ^ a b Shah SA, Erdmann S, Mojica FJ, Garrett RA (May 2013). "Protospacer recognition motifs: mixed identities and functional diversity". RNA Biology. 10 (5): 891–9. doi:10.4161/rna.23764. PMC 3737346  . PMID 23403393. ^ Andersson AF, Banfield JF (May 2008). "Virus population dynamics and acquired virus resistance in natural microbial communities". Science. 320 (5879): 1047–50. Bibcode:2008Sci...320.1047A. doi:10.1126/science.1157358. PMID 18497291. ^ a b c d Pride DT, Sun CL, Salzman J, Rao N, Loomer P, Armitage GC, et al. (January 2011). "Analysis of streptococcal CRISPRs from human saliva reveals substantial sequence diversity within and between subjects over time". Genome Research. 21 (1): 126–36. doi:10.1101/gr.111732.110. PMC 3012920  . PMID 21149389. ^ a b Goren MG, Yosef I, Auster O, Qimron U (October 2012). "Experimental definition of a clustered regularly interspaced short palindromic duplicon in Escherichia coli". Journal of Molecular Biology. 423 (1): 14–6. doi:10.1016/j.jmb.2012.06.037. PMID 22771574. ^ a b c Datsenko KA, Pougach K, Tikhonov A, Wanner BL, Severinov K, Semenova E (July 2012). "Molecular memory of prior infections activates the CRISPR/Cas adaptive bacterial immunity system". Nature Communications. 3: 945. Bibcode:2012NatCo...3E.945D. doi:10.1038/ncomms1937. PMID 22781758. ^ Gesner EM, Schellenberg MJ, Garside EL, George MM, Macmillan AM (June 2011). "Recognition and maturation of effector RNAs in a CRISPR interference pathway". Nature Structural & Molecular Biology. 18 (6): 688–92. doi:10.1038/nsmb.2042. PMID 21572444. ^ Sashital DG, Jinek M, Doudna JA (June 2011). "An RNA-induced conformational change required for CRISPR RNA cleavage by the endoribonuclease Cse3". Nature Structural & Molecular Biology. 18 (6): 680–7. doi:10.1038/nsmb.2043. PMID 21572442. ^ Haurwitz RE, Jinek M, Wiedenheft B, Zhou K, Doudna JA (September 2010). "Sequence- and structure-specific RNA processing by a CRISPR endonuclease". Science. 329 (5997): 1355–8. Bibcode:2010Sci...329.1355H. doi:10.1126/science.1192272. PMC 3133607  . PMID 20829488. ^ a b c Kunin V, Sorek R, Hugenholtz P (2007). "Evolutionary conservation of sequence and secondary structures in CRISPR repeats". Genome Biology. 8 (4): R61. doi:10.1186/gb-2007-8-4-r61. PMC 1896005  . PMID 17442114. ^ Carte J, Wang R, Li H, Terns RM, Terns MP (December 2008). "Cas6 is an endoribonuclease that generates guide RNAs for invader defense in prokaryotes". Genes & Development. 22 (24): 3489–96. doi:10.1101/gad.1742908. PMC 2607076  . PMID 19141480. ^ Wang R, Preamplume G, Terns MP, Terns RM, Li H (February 2011). "Interaction of the Cas6 riboendonuclease with CRISPR RNAs: recognition and cleavage". Structure. 19 (2): 257–64. doi:10.1016/j.str.2010.11.014. PMC 3154685  . PMID 21300293. ^ Niewoehner O, Jinek M, Doudna JA (January 2014). "Evolution of CRISPR RNA recognition and processing by Cas6 endonucleases". Nucleic Acids Research. 42 (2): 1341–53. doi:10.1093/nar/gkt922. PMC 3902920  . PMID 24150936. ^ Semenova E, Jore MM, Datsenko KA, Semenova A, Westra ER, Wanner B, et al. (June 2011). "Interference by clustered regularly interspaced short palindromic repeat (CRISPR) RNA is governed by a seed sequence". Proceedings of the National Academy of Sciences of the United States of America. 108 (25): 10098–103. Bibcode:2011PNAS..10810098S. doi:10.1073/pnas.1104144108. PMC 3121866  . PMID 21646539. ^ Gudbergsdottir S, Deng L, Chen Z, Jensen JV, Jensen LR, She Q, Garrett RA (January 2011). "Dynamic properties of the Sulfolobus CRISPR/Cas and CRISPR/Cmr systems when challenged with vector-borne viral and plasmid genes and protospacers". Molecular Microbiology. 79 (1): 35–49. doi:10.1111/j.1365-2958.2010.07452.x. PMC 3025118  . PMID 21166892. ^ Manica A, Zebec Z, Teichmann D, Schleper C (April 2011). "In vivo activity of CRISPR-mediated virus defence in a hyperthermophilic archaeon". Molecular Microbiology. 80 (2): 481–91. doi:10.1111/j.1365-2958.2011.07586.x. PMID 21385233. ^ Jore MM, Lundgren M, van Duijn E, Bultema JB, Westra ER, Waghmare SP, et al. (May 2011). "Structural basis for CRISPR RNA-guided DNA recognition by Cascade". Nature Structural & Molecular Biology. 18 (5): 529–36. doi:10.1038/nsmb.2019. PMID 21460843. ^ Wiedenheft B, Lander GC, Zhou K, Jore MM, Brouns SJ, van der Oost J, Doudna JA, Nogales E (September 2011). "Structures of the RNA-guided surveillance complex from a bacterial immune system". Nature. 477 (7365): 486–9. Bibcode:2011Natur.477..486W. doi:10.1038/nature10402. PMC 4165517  . PMID 21938068. ^ Zhang J, Rouillon C, Kerou M, Reeks J, Brugger K, Graham S, Reimann J, Cannone G, Liu H, Albers SV, Naismith JH, Spagnolo L, White MF (February 2012). "Structure and mechanism of the CMR complex for CRISPR-mediated antiviral immunity". Molecular Cell. 45 (3): 303–13. doi:10.1016/j.molcel.2011.12.013. PMC 3381847  . PMID 22227115. ^ a b Hale CR, Zhao P, Olson S, Duff MO, Graveley BR, Wells L, Terns RM, Terns MP (November 2009). "RNA-guided RNA cleavage by a CRISPR RNA-Cas protein complex". Cell. 139 (5): 945–56. doi:10.1016/j.cell.2009.07.040. PMC 2951265  . PMID 19945378. ^ a b c Marraffini LA, Sontheimer EJ (January 2010). "Self versus non-self discrimination during CRISPR RNA-directed immunity". Nature. 463 (7280): 568–71. Bibcode:2010Natur.463..568M. doi:10.1038/nature08703. PMC 2813891  . PMID 20072129. ^ Koonin EV, Wolf YI (November 2009). "Is evolution Darwinian or/and Lamarckian?". Biology Direct. 4: 42. doi:10.1186/1745-6150-4-42. PMC 2781790  . PMID 19906303. ^ Weiss A (October 2015). "Lamarckian Illusions". Trends in Ecology & Evolution. 30 (10): 566–8. doi:10.1016/j.tree.2015.08.003. PMID 26411613. ^ Heidelberg JF, Nelson WC, Schoenfeld T, Bhaya D (2009). Ahmed N, ed. "Germ warfare in a microbial mat community: CRISPRs provide insights into the co-evolution of host and viral genomes". PLOS One. 4 (1): e4169. Bibcode:2009PLoSO...4.4169H. doi:10.1371/journal.pone.0004169. PMC 2612747  . PMID 19132092. ^ Sampson TR, Saroj SD, Llewellyn AC, Tzeng YL, Weiss DS (May 2013). "A CRISPR/Cas system mediates bacterial innate immune evasion and virulence". Nature. 497 (7448): 254–7. Bibcode:2013Natur.497..254S. doi:10.1038/nature12048. PMC 3651764  . PMID 23584588. ^ Touchon M, Rocha EP (June 2010). Randau L, ed. "The small, slow and specialized CRISPR and anti-CRISPR of Escherichia and Salmonella". PLOS One. 5 (6): e11126. Bibcode:2010PLoSO...511126T. doi:10.1371/journal.pone.0011126. PMC 2886076  . PMID 20559554. ^ a b c Rho M, Wu YW, Tang H, Doak TG, Ye Y (2012). "Diverse CRISPRs evolving in human microbiomes". PLoS Genetics. 8 (6): e1002441. doi:10.1371/journal.pgen.1002441. PMC 3374615  . PMID 22719260. ^ a b Sun CL, Barrangou R, Thomas BC, Horvath P, Fremaux C, Banfield JF (February 2013). "Phage mutations in response to CRISPR diversification in a bacterial population". Environmental Microbiology. 15 (2): 463–70. doi:10.1111/j.1462-2920.2012.02879.x. PMID 23057534. ^ Kuno S, Sako Y, Yoshida T (May 2014). "Diversification of CRISPR within coexisting genotypes in a natural population of the bloom-forming cyanobacterium Microcystis aeruginosa". Microbiology. 160 (Pt 5): 903–16. doi:10.1099/mic.0.073494-0. PMID 24586036. ^ Bland C, Ramsey TL, Sabree F, Lowe M, Brown K, Kyrpides NC, Hugenholtz P (June 2007). "CRISPR recognition tool (CRT): a tool for automatic detection of clustered regularly interspaced palindromic repeats". BMC Bioinformatics. 8: 209. doi:10.1186/1471-2105-8-209. PMC 1924867  . PMID 17577412. ^ Edgar RC (January 2007). "PILER-CR: fast and accurate identification of CRISPR repeats". BMC Bioinformatics. 8: 18. doi:10.1186/1471-2105-8-18. PMC 1790904  . PMID 17239253. ^ Grissa I, Vergnaud G, Pourcel C (July 2007). "CRISPRFinder: a web tool to identify clustered regularly interspaced short palindromic repeats". Nucleic Acids Research. 35 (Web Server issue): W52–7. doi:10.1093/nar/gkm360. PMC 1933234  . PMID 17537822. ^ Pride DT, Salzman J, Relman DA (September 2012). "Comparisons of clustered regularly interspaced short palindromic repeats and viromes in human saliva reveal bacterial adaptations to salivary viruses". Environmental Microbiology. 14 (9): 2564–76. doi:10.1111/j.1462-2920.2012.02775.x. PMC 3424356  . PMID 22583485. ^ Held NL, Herrera A, Whitaker RJ (November 2013). "Reassortment of CRISPR repeat-spacer loci in Sulfolobus islandicus". Environmental Microbiology. 15 (11): 3065–76. doi:10.1111/1462-2920.12146. PMID 23701169. ^ Held NL, Herrera A, Cadillo-Quiroz H, Whitaker RJ (September 2010). "CRISPR associated diversity within a population of Sulfolobus islandicus". PLOS One. 5 (9): e12988. Bibcode:2010PLoSO...512988H. doi:10.1371/journal.pone.0012988. PMC 2946923  . PMID 20927396. ^ Skennerton CT, Imelfort M, Tyson GW (May 2013). "Crass: identification and reconstruction of CRISPR from unassembled metagenomic data". Nucleic Acids Research. 41 (10): e105. doi:10.1093/nar/gkt183. PMC 3664793  . PMID 23511966. ^ Stern A, Mick E, Tirosh I, Sagy O, Sorek R (October 2012). "CRISPR targeting reveals a reservoir of common phages associated with the human gut microbiome". Genome Research. 22 (10): 1985–94. doi:10.1101/gr.138297.112. PMC 3460193  . PMID 22732228. ^ Novick RP, Christie GE, Penadés JR (August 2010). "The phage-related chromosomal islands of Gram-positive bacteria". Nature Reviews Microbiology. 8 (8): 541–51. doi:10.1038/nrmicro2393. PMC 3522866  . PMID 20634809. ^ Seed KD, Lazinski DW, Calderwood SB, Camilli A (February 2013). "A bacteriophage encodes its own CRISPR/Cas adaptive response to evade host innate immunity". Nature. 494 (7438): 489–91. Bibcode:2013Natur.494..489S. doi:10.1038/nature11927. PMC 3587790  . PMID 23446421. ^ Doudna JA, Charpentier E (November 2014). "Genome editing. The new frontier of genome engineering with CRISPR-Cas9". Science. 346 (6213): 1258096. doi:10.1126/science.1258096. PMID 25430774. ^ a b Ledford H (June 2015). "CRISPR, the disruptor". Nature. 522 (7554): 20–4. Bibcode:2015Natur.522...20L. doi:10.1038/522020a. PMID 26040877. ^ Alphey L (2016). "Can CRISPR-Cas9 gene drives curb malaria?". Nature Biotechnology. 34 (2): 149–50. doi:10.1038/nbt.3473. PMID 26849518. ^ Ledford H (2017). "CRISPR studies muddy results of older gene research". Nature. doi:10.1038/nature.2017.21763. ^ Young S (11 February 2014). "CRISPR and Other Genome Editing Tools Boost Medical Research and Gene Therapy's Reach". MIT Technology Review. Cambridge, Massachusetts: Massachusetts Institute of Technology. Retrieved 2014-04-13. ^ a b Heidenreich M, Zhang F (January 2016). "Applications of CRISPR-Cas systems in neuroscience". Nature Reviews. Neuroscience. 17 (1): 36–44. doi:10.1038/nrn.2015.2. PMC 4899966  . PMID 26656253. ^ Barrangou R, Doudna JA (September 2016). "Applications of CRISPR technologies in research and beyond". Nature Biotechnology. 34 (9): 933–941. doi:10.1038/nbt.3659. PMID 27606440. ^ Cox DB, Platt RJ, Zhang F (February 2015). "Therapeutic genome editing: prospects and challenges". Nature Medicine. 21 (2): 121–31. doi:10.1038/nm.3793. PMC 4492683  . PMID 25654603. ^ "CRISPR/Cas9 Plasmids". www.systembio.com. Retrieved 2015-12-17. ^ "CRISPR Cas9 Genome Editing". www.origene.com. OriGene. Retrieved 2015-12-17. ^ a b c d e Ran FA, Hsu PD, Wright J, Agarwala V, Scott DA, Zhang F (November 2013). "Genome engineering using the CRISPR-Cas9 system". Nature Protocols. 8 (11): 2281–308. doi:10.1038/nprot.2013.143. PMC 3969860  . PMID 24157548. ^ Ly, Joseph (2013). Discovering Genes Responsible for Kidney Diseases (Ph.D.). University of Toronto. Retrieved 26 December 2016. ^ Horvath P, Barrangou R (January 2010). "CRISPR/Cas, the immune system of bacteria and archaea". Science. 327 (5962): 167–70. Bibcode:2010Sci...327..167H. doi:10.1126/science.1179555. PMID 20056882. ^ Bialk P, Rivera-Torres N, Strouse B, Kmiec EB (2015-06-08). "Regulation of Gene Editing Activity Directed by Single-Stranded Oligonucleotides and CRISPR/Cas9 Systems". PLOS One. 10 (6): e0129308. Bibcode:2015PLoSO..1029308B. doi:10.1371/journal.pone.0129308. PMC 4459703  . PMID 26053390. ^ Robert Sanders (12 November 2015). "CRISPR-Cas9 gene editing: check three times, cut once". University of California, Berkeley. Archived from the original on 26 December 2016. Retrieved 26 December 2016. ^ "Optimized CRISPR Design". crispr.mit.edu. Retrieved 2015-12-20. ^ Lino CA, Harper JC, Carney JP, Timlin JA (November 2018). "Delivering CRISPR: a review of the challenges and approaches". Drug Delivery. 25 (1): 1234–1257. doi:10.1080/10717544.2018.1474964. PMID 29801422. ^ Li L, Hu S, Chen X (July 2018). "Non-viral delivery systems for CRISPR/Cas9-based genome editing: Challenges and opportunities". Biomaterials. 171: 207–218. doi:10.1016/j.biomaterials.2018.04.031. PMID 29704747. ^ Schmidt F, Grimm D (February 2015). "CRISPR genome engineering and viral gene delivery: a case of mutual attraction". Biotechnology Journal. 10 (2): 258–72. doi:10.1002/biot.201400529. PMID 25663455. ^ Waxmonsky N (24 September 2015). "CRISPR 101: Mammalian Expression Systems and Delivery Methods". Retrieved 11 June 2018. ^ Zimmerman C (Oct 15, 2015). "Editing of Pig DNA May Lead to More Organs for People". NY Times. ^ Hale CR, Majumdar S, Elmore J, Pfister N, Compton M, Olson S, Resch AM, Glover CV, Graveley BR, Terns RM, Terns MP (February 2012). "Essential features and rational design of CRISPR RNAs that function with the Cas RAMP module complex to cleave RNAs". Molecular Cell. 45 (3): 292–302. doi:10.1016/j.molcel.2011.10.023. PMC 3278580  . PMID 22227116. ^ Sorek R, Kunin V, Hugenholtz P (March 2008). "CRISPR--a widespread system that provides acquired resistance against phages in bacteria and archaea". Nature Reviews Microbiology. 6 (3): 181–6. doi:10.1038/nrmicro1793. PMID 18157154. Hou Z, Zhang Y, Propson NE, Howden SE, Chu LF, Sontheimer EJ, Thomson JA (September 2013). "Efficient genome engineering in human pluripotent stem cells using Cas9 from Neisseria meningitidis". Proceedings of the National Academy of Sciences of the United States of America. 110 (39): 15644–9. Bibcode:2013PNAS..11015644H. doi:10.1073/pnas.1313587110. PMC 3785731  . PMID 23940360. ^ a b Oakes BL, Nadler DC, Flamholz A, Fellmann C, Staahl BT, Doudna JA, Savage DF (June 2016). "Profiling of engineering hotspots identifies an allosteric CRISPR-Cas9 switch". Nature Biotechnology. 34 (6): 646–51. doi:10.1038/nbt.3528. PMC 4900928  . PMID 27136077. ^ Nuñez JK, Harrington LB, Doudna JA (March 2016). "Chemical and Biophysical Modulation of Cas9 for Tunable Genome Engineering". ACS Chemical Biology. 11 (3): 681–8. doi:10.1021/acschembio.5b01019. PMID 26857072. ^ Zhou W, Deiters A (April 2016). "Conditional Control of CRISPR/Cas9 Function". Angewandte Chemie. 55 (18): 5394–9. doi:10.1002/anie.201511441. PMID 26996256. ^ Polstein LR, Gersbach CA (March 2015). "A light-inducible CRISPR-Cas9 system for control of endogenous gene activation". Nature Chemical Biology. 11 (3): 198–200. doi:10.1038/nchembio.1753. PMC 4412021  . PMID 25664691. ^ Nihongaki Y, Yamamoto S, Kawano F, Suzuki H, Sato M (February 2015). "CRISPR-Cas9-based photoactivatable transcription system". Chemistry & Biology. 22 (2): 169–74. doi:10.1016/j.chembiol.2014.12.011. PMID 25619936. ^ Wright AV, Sternberg SH, Taylor DW, Staahl BT, Bardales JA, Kornfeld JE, Doudna JA (March 2015). "Rational design of a split-Cas9 enzyme complex". Proceedings of the National Academy of Sciences of the United States of America. 112 (10): 2984–9. Bibcode:2015PNAS..112.2984W. doi:10.1073/pnas.1501698112. PMC 4364227  . PMID 25713377. ^ Nihongaki Y, Kawano F, Nakajima T, Sato M (July 2015). "Photoactivatable CRISPR-Cas9 for optogenetic genome editing". Nature Biotechnology. 33 (7): 755–60. doi:10.1038/nbt.3245. PMID 26076431. ^ Hemphill J, Borchardt EK, Brown K, Asokan A, Deiters A (May 2015). "Optical Control of CRISPR/Cas9 Gene Editing". Journal of the American Chemical Society. 137 (17): 5642–5. doi:10.1021/ja512664v. PMC 4919123  . PMID 25905628. ^ Jain PK, Ramanan V, Schepers AG, Dalvie NS, Panda A, Fleming HE, Bhatia SN (September 2016). "Development of Light-Activated CRISPR Using Guide RNAs with Photocleavable Protectors". Angewandte Chemie. 55 (40): 12440–4. doi:10.1002/anie.201606123. PMC 5864249  . PMID 27554600. ^ Davis KM, Pattanayak V, Thompson DB, Zuris JA, Liu DR (May 2015). "Small molecule-triggered Cas9 protein with improved genome-editing specificity". Nature Chemical Biology. 11 (5): 316–8. doi:10.1038/nchembio.1793. PMC 4402137  . PMID 25848930. ^ Liu KI, Ramli MN, Woo CW, Wang Y, Zhao T, Zhang X, Yim GR, Chong BY, Gowher A, Chua MZ, Jung J, Lee JH, Tan MH (November 2016). "A chemical-inducible CRISPR-Cas9 system for rapid control of genome editing". Nature Chemical Biology. 12 (11): 980–987. doi:10.1038/nchembio.2179. PMID 27618190. ^ Truong DJ, Kühner K, Kühn R, Werfel S, Engelhardt S, Wurst W, Ortiz O (July 2015). "Development of an intein-mediated split-Cas9 system for gene therapy". Nucleic Acids Research. 43 (13): 6450–8. doi:10.1093/nar/gkv601. PMC 4513872  . PMID 26082496. ^ Zetsche B, Volz SE, Zhang F (February 2015). "A split-Cas9 architecture for inducible genome editing and transcription modulation". Nature Biotechnology. 33 (2): 139–42. doi:10.1038/nbt.3149. PMC 4503468  . PMID 25643054. ^ González F, Zhu Z, Shi ZD, Lelli K, Verma N, Li QV, Huangfu D (August 2014). "An iCRISPR platform for rapid, multiplexable, and inducible genome editing in human pluripotent stem cells". Cell Stem Cell. 15 (2): 215–26. doi:10.1016/j.stem.2014.05.018. PMC 4127112  . PMID 24931489. ^ Dow LE, Fisher J, O'Rourke KP, Muley A, Kastenhuber ER, Livshits G, Tschaharganeh DF, Socci ND, Lowe SW (April 2015). "Inducible in vivo genome editing with CRISPR-Cas9". Nature Biotechnology. 33 (4): 390–4. doi:10.1038/nbt.3155. PMC 4390466  . PMID 25690852. ^ Yu C, Liu Y, Ma T, Liu K, Xu S, Zhang Y, Liu H, La Russa M, Xie M, Ding S, Qi LS (February 2015). "Small molecules enhance CRISPR genome editing in pluripotent stem cells". Cell Stem Cell. 16 (2): 142–7. doi:10.1016/j.stem.2015.01.003. PMC 4461869  . PMID 25658371. ^ Maruyama T, Dougan SK, Truttmann MC, Bilate AM, Ingram JR, Ploegh HL (May 2015). "Increasing the efficiency of precise genome editing with CRISPR-Cas9 by inhibition of nonhomologous end joining". Nature Biotechnology. 33 (5): 538–42. doi:10.1038/nbt.3190. PMC 4618510  . PMID 25798939. ^ Gao X, Tao Y, Lamas V, Huang M, Yeh WH, Pan B, et al. (December 2017). "Treatment of autosomal dominant hearing loss by in vivo delivery of genome editing agents". Nature. 553 (7687): 217–221. Bibcode:2018Natur.553..217G. doi:10.1038/nature25164. PMC 5784267  . PMID 29258297. ^ Ledford, Heidi (2016-03-07). "CRISPR: gene editing is just the beginning". Nature. 531 (7593): 156–159. Bibcode:2016Natur.531..156L. doi:10.1038/531156a. ISSN 0028-0836. ^ a b c d e Science News Staff (December 17, 2015). "And Science's Breakthrough of the Year is ..." news.sciencemag.org. Retrieved 2015-12-21. ^ Dominguez AA, Lim WA, Qi LS (January 2016). "Beyond editing: repurposing CRISPR-Cas9 for precision genome regulation and interrogation". Nature Reviews Molecular Cell Biology. 17 (1): 5–15. doi:10.1038/nrm.2015.2. PMC 4922510  . PMID 26670017. ^ Shalem O, Sanjana NE, Hartenian E, Shi X, Scott DA, Mikkelsen TS, Heckl D, Ebert BL, Root DE, Doench JG, Zhang F (January 2014). "Genome-scale CRISPR-Cas9 knockout screening in human cells". Science. 343 (6166): 84–7. Bibcode:2014Sci...343...84S. doi:10.1126/science.1247005. PMC 4089965  . PMID 24336571. ^ a b Zimmer C (2016-06-03). "Scientists Find Form of Crispr Gene Editing With New Capabilities". The New York Times. ISSN 0362-4331. Retrieved 2016-06-10. ^ Basak J, Nithin C (2015). "Targeting Non-Coding RNAs in Plants with the CRISPR-Cas Technology is a Challenge yet Worth Accepting". Frontiers in Plant Science. 6: 1001. doi:10.3389/fpls.2015.01001. PMC 4652605  . PMID 26635829. ^ van Erp PB, Bloomer G, Wilkinson R, Wiedenheft B (June 2015). "The history and market impact of CRISPR RNA-guided nucleases". Current Opinion in Virology. 12: 85–90. doi:10.1016/j.coviro.2015.03.011. PMC 4470805  . PMID 25914022. ^ Maggio I, Gonçalves MA (May 2015). "Genome editing at the crossroads of delivery, specificity, and fidelity". Trends in Biotechnology. 33 (5): 280–91. doi:10.1016/j.tibtech.2015.02.011. PMID 25819765. ^ Rath D, Amlinger L, Rath A, Lundgren M (October 2015). "The CRISPR-Cas immune system: biology, mechanisms and applications". Biochimie. 117: 119–28. doi:10.1016/j.biochi.2015.03.025. PMID 25868999. ^ a b Freedman BS, Brooks CR, Lam AQ, Fu H, Morizane R, Agrawal V, et al. (October 2015). "Modelling kidney disease with CRISPR-mutant kidney organoids derived from human pluripotent epiblast spheroids". Nature Communications. 6: 8715. Bibcode:2015NatCo...6E8715F. doi:10.1038/ncomms9715. PMC 4620584  . PMID 26493500. ^ Cruz NM, Song X, Czerniecki SM, Gulieva RE, Churchill AJ, Kim YK, et al. (November 2017). "Organoid cystogenesis reveals a critical role of microenvironment in human polycystic kidney disease". Nature Materials. 16 (11): 1112–1119. Bibcode:2017NatMa..16.1112C. doi:10.1038/nmat4994. PMID 28967916. ^ Kim YK, Refaeli I, Brooks CR, Jing P, Gulieva RE, Hughes MR, et al. (December 2017). "Gene-Edited Human Kidney Organoids Reveal Mechanisms of Disease in Podocyte Development". Stem Cells. 35 (12): 2366–2378. doi:10.1002/stem.2707. PMC 5742857  . PMID 28905451. ^ Bellin M, Casini S, Davis RP, D'Aniello C, Haas J, Ward-van Oostwaard D, Tertoolen LG, Jung CB, Elliott DA, Welling A, Laugwitz KL, Moretti A, Mummery CL (December 2013). "Isogenic human pluripotent stem cell pairs reveal the role of a KCNH2 mutation in long-QT syndrome". The EMBO Journal. 32 (24): 3161–75. doi:10.1038/emboj.2013.240. PMC 3981141  . PMID 24213244. ^ Akbari OS, Bellen HJ, Bier E, Bullock SL, Burt A, Church GM, et al. (August 2015). "BIOSAFETY. Safeguarding gene drive experiments in the laboratory". Science. 349 (6251): 927–9. Bibcode:2015Sci...349..927A. doi:10.1126/science.aac7932. PMC 4692367  . PMID 26229113. ^ Caplan AL, Parent B, Shen M, Plunkett C (November 2015). "No time to waste--the ethical challenges created by CRISPR: CRISPR/Cas, being an efficient, simple, and cheap technology to edit the genome of any organism, raises many ethical and regulatory issues beyond the use to manipulate human germ line cells". EMBO Reports. 16 (11): 1421–6. doi:10.15252/embr.201541337. PMC 4641494  . PMID 26450575. ^ Oye KA, Esvelt K, Appleton E, Catteruccia F, Church G, Kuiken T, et al. (August 2014). "Biotechnology. Regulating gene drives". Science. 345 (6197): 626–8. Bibcode:2014Sci...345..626O. doi:10.1126/science.1254287. PMID 25035410. ^ Gomaa AA, Klumpe HE, Luo ML, Selle K, Barrangou R, Beisel CL (January 2014). "Programmable removal of bacterial strains by use of genome-targeting CRISPR-Cas systems". MBio. 5 (1): e00928–13. doi:10.1128/mBio.00928-13. PMC 3903277  . PMID 24473129. ^ Citorik RJ, Mimee M, Lu TK (November 2014). "Sequence-specific antimicrobials using efficiently delivered RNA-guided nucleases". Nature Biotechnology. 32 (11): 1141–5. doi:10.1038/nbt.3011. PMC 4237163  . PMID 25240928. ^ a b Gholizadeh P, Aghazadeh M, Asgharzadeh M, Kafil HS (October 2017). "Suppressing the CRISPR/Cas adaptive immune system in bacterial infections". European Journal of Clinical Microbiology & Infectious Diseases. 36 (11): 2043–2051. doi:10.1007/s10096-017-3036-2. PMID 28601970. ^ van Diemen FR, Kruse EM, Hooykaas MJ, Bruggeling CE, Schürch AC, van Ham PM, Imhof SM, Nijhuis M, Wiertz EJ, Lebbink RJ (2016). "CRISPR/Cas9-Mediated Genome Editing of Herpesviruses Limits Productive and Latent Infections". PLoS Pathogens. 12 (6): e1005701. doi:10.1371/journal.ppat.1005701. PMC 4928872  . PMID 27362483. Lay summary – PLOS Media YouTube Channel. ^ Liu Y, Zhan Y, Chen Z, He A, Li J, Wu H, Liu L, Zhuang C, Lin J, Guo X, Zhang Q, Huang W, Cai Z (September 2016). "Directing cellular information flow via CRISPR signal conductors". Nature Methods. 13 (11): 938–944. doi:10.1038/nmeth.3994. PMID 27595406. ^ Mullin E. "Using CRISPR on pigs could make their organs safer for human transplant". MIT Technology Review. Retrieved 2017-09-09. ^ Abrahimi P, Chang WG, Kluger MS, Qyang Y, Tellides G, Saltzman WM, Pober JS (July 2015). "Efficient gene disruption in cultured primary human endothelial cells by CRISPR/Cas9". Circulation Research. 117 (2): 121–8. doi:10.1161/CIRCRESAHA.117.306290. PMC 4490936  . PMID 25940550. ^ Khan FA, Pandupuspitasari NS, Chun-Jie H, Ao Z, Jamal M, Zohaib A, Khan FA, Hakim MR, ShuJun Z (August 2016). "CRISPR/Cas9 therapeutics: a cure for cancer and other genetic diseases". Oncotarget. 7 (32): 52541–52552. doi:10.18632/oncotarget.9646. PMC 5239572  . PMID 27250031. ^ Le Page M (7 June 2017). "Boom in human gene editing as 20 CRISPR trials gear up". New Scientist. ^ Reardon S (2016). "First CRISPR clinical trial gets green light from US panel". Nature. doi:10.1038/nature.2016.20137. ^ Yong E (2015-11-25). "The Revolutionary Gene-Editing Technique That Reveals Cancer's Weaknesses". The Atlantic. Retrieved 2016-02-21. ^ Sandweiss AJ, McIntosh MI, Moutal A, Davidson-Knapp R, Hu J, Giri AK, Yamamoto T, Hruby VJ, Khanna R, Largent-Milnes TM, Vanderah TW (May 2017). "Genetic and pharmacological antagonism of NK1 receptor prevents opiate abuse potential". Molecular Psychiatry. doi:10.1038/mp.2017.102. PMC 5680162  . PMID 28485408. ^ Staahl BT, Benekareddy M, Coulon-Bainier C, Banfal AA, Floor SN, Sabo JK, Urnes C, Munares GA, Ghosh A, Doudna JA (May 2017). "Efficient genome editing in the mouse brain by local delivery of engineered Cas9 ribonucleoprotein complexes". Nature Biotechnology. 35 (5): 431–434. doi:10.1038/nbt.3806. PMID 28191903. ^ Gu W, Crawford ED, O'Donovan BD, Wilson MR, Chow ED, Retallack H, DeRisi JL (March 2016). "Depletion of Abundant Sequences by Hybridization (DASH): using Cas9 to remove unwanted high-abundance species in sequencing libraries and molecular counting applications". Genome Biology. 17: 41. doi:10.1186/s13059-016-0904-5. PMC 4778327  . PMID 26944702. ^ Zuo E, Huo X, Yao X, Hu X, Sun Y, Yin J, et al. (2017). "CRISPR/Cas9-mediated targeted chromosome elimination". Genome Biology. 18 (1): 224. doi:10.1186/s13059-017-1354-4. PMC 5701507  . PMID 29178945. Lay summary – Genome Web. ^ Swings T, Marciano DC, Atri B, Bosserman RE, Wang C, Leysen M, Bonte C, Schalck T, Furey I, Van den Bergh B, Verstraeten N, Christie PJ, Herman C, Lichtarge O, Michiels J (June 2018). "CRISPR-FRT targets shared sites in a knock-out collection for off-the-shelf genome editing". Nature Communications. 9 (1): 2231. doi:10.1038/s41467-018-04651-5. PMID 29884781. ^ Reisch CR, Prather KL (October 2015). "The no-SCAR (Scarless Cas9 Assisted Recombineering) system for genome editing in Escherichia coli". Scientific Reports. 5 (1): 15096. Bibcode:2015NatSR...515096R. doi:10.1038/srep15096. PMID 26463009. ^ Jiang Y, Chen B, Duan C, Sun B, Yang J, Yang S (April 2015). "Multigene editing in the Escherichia coli genome via the CRISPR-Cas9 system". Applied and Environmental Microbiology. 81 (7): 2506–14. doi:10.1128/AEM.04023-14. PMC 4357945  . PMID 25636838. ^ a b Feng Z, Mao Y, Xu N, Zhang B, Wei P, Yang DL, Wang Z, Zhang Z, Zheng R, Yang L, Zeng L (2014). "Multigeneration analysis reveals the inheritance, specificity, and patterns of CRISPR/Cas-induced gene modifications in Arabidopsis". Proceedings of the National Academy of Sciences. 111 (12): 4632–4637. Bibcode:2014PNAS..111.4632F. doi:10.1073/pnas.1400822111. PMC 3970504  . ^ a b Lin S, Ewen-Campen B, Ni X, Housden BE, Perrimon N (October 2015). "In Vivo Transcriptional Activation Using CRISPR/Cas9 in Drosophila". Genetics. 201 (2): 433–42. doi:10.1534/genetics.115.181065. PMC 4596659  . PMID 26245833. ^ a b Soni D, Wang DM, Regmi SC, Mittal M, Vogel SM, Schlüter D, Tiruppathi C (May 2018). "Deubiquitinase function of A20 maintains and repairs endothelial barrier after lung vascular injury". Cell Death Discovery. 4 (60). doi:10.1038/s41420-018-0056-3. ^ Fye S. "Genetic Rough Draft: Editas and CRISPR". The Atlas Business Journal. Retrieved 19 January 2016. ^ Pollack A (15 February 2017). "Harvard and M.I.T. Scientists Win Gene-Editing Patent Fight". The New York Times. ^ Akst J (February 15, 2017). "Broad Wins CRISPR Patent Interference Case". The Scientist Magazine. ^ Noonan KE (February 16, 2017). "PTAB Decides CRISPR Interference in Favor of Broad Institute -- Their Reasoning". Patent Docs. ^ Potenza A (April 13, 2017). "UC Berkeley challenges decision that CRISPR patents belong to Broad Institute 3 comments The legal fight will likely continue for months or even years". The Verge. Retrieved 22 September 2017. ^ Buhr S (July 26, 2017). "The CRISPR patent battle is back on as UC Berkeley files an appeal". TechCrunch. Retrieved 22 September 2017. ^ Staff (1 April 2015). "News: Products & Services". Genetic Engineering & Biotechnology News (Paper). 35 (7): 8. ^ a b Philippidis, Alex (August 7, 2017). "MilliporeSigma to Be Granted European Patent for CRISPR Technology". Genetic Engineering & Biotechology News. Retrieved 22 September 2017. ^ Akst J (March 24, 2017). "UC Berkeley Receives CRISPR Patent in Europe". The Scientist. Retrieved 22 September 2017. ^ Cohen J (4 August 2017). "CRISPR patent battle in Europe takes a 'wild' twist with surprising player". Science. doi:10.1126/science.aan7211. ^ a b Rana P, Marcus AD, Fan W (2018-01-21). "China, Unhampered by Rules, Races Ahead in Gene-Editing Trials". Wall Street Journal. ISSN 0099-9660. Retrieved 2018-01-23. ^ Brown KV. "China Has Already Gene-Edited 86 People With CRISPR". Gizmodo. Retrieved 2018-01-23. ^ Regalado A (March 5, 2015). "Engineering the Perfect Baby". MIT Technology Review. ^ Wade N (19 March 2015). "Scientists Seek Ban on Method of Editing the Human Genome". The New York Times. Retrieved 20 March 2015. The biologists writing in Science support continuing laboratory research with the technique, and few if any scientists believe it is ready for clinical use. ^ Liang P, Xu Y, Zhang X, Ding C, Huang R, Zhang Z, Lv J, Xie X, Chen Y, Li Y, Sun Y, Bai Y, Songyang Z, Ma W, Zhou C, Huang J (May 2015). "CRISPR/Cas9-mediated gene editing in human tripronuclear zygotes". Protein & Cell. 6 (5): 363–72. doi:10.1007/s13238-015-0153-5. PMC 4417674  . PMID 25894090. ^ Kolata G (23 April 2015). "Chinese Scientists Edit Genes of Human Embryos, Raising Concerns". The New York Times. Retrieved 24 April 2015. ^ a b Cyranoski D, Reardon S (2015). "Chinese scientists genetically modify human embryos". Nature. doi:10.1038/nature.2015.17378. ^ Regalado A (2016-05-08). "Chinese Researchers Experiment with Making HIV-Proof Embryos". MIT Technology Review. Retrieved 2016-06-10. ^ "International Summit on Gene Editing". National Academies of Sciences, Engineering, and Medicine. 3 December 2015. Retrieved 3 December 2015. ^ Callaway E (February 2016). "UK scientists gain licence to edit genes in human embryos". Nature. 530 (7588): 18. Bibcode:2016Natur.530...18C. doi:10.1038/nature.2016.19270. PMID 26842037. ^ McHughen A, Smyth S (January 2008). "US regulatory system for genetically modified [genetically modified organism (GMO), rDNA or transgenic] crop cultivars". Plant Biotechnology Journal. 6 (1): 2–12. doi:10.1111/j.1467-7652.2007.00300.x. PMID 17956539. ^ USDA. "Re: Request to confirm" (PDF). ^ Waltz E (2016). "Gene-edited CRISPR mushroom escapes US regulation". Nature. 532 (7599): 293. Bibcode:2016Natur.532..293W. doi:10.1038/nature.2016.19754. PMID 27111611. ^ Ledford H (April 2016). "Gene-editing surges as US rethinks regulations". Nature. 532 (7598): 158–9. Bibcode:2016Natur.532..158L. doi:10.1038/532158a. PMID 27075074. ^ Cyranoski D (2017). "China's embrace of embryo selection raises thorny questions". Nature. 548 (7667): 272–274. Bibcode:2017Natur.548..272C. doi:10.1038/548272a. PMID 28816265. ^ Peng Y (2016). "The morality and ethics governing CRISPR-Cas9 patents in China". Nature Biotechnology. 34 (6): 616–8. doi:10.1038/nbt.3590. PMID 27281418. ^ Talbot D (2016). "Precise Gene Editing in Plants/ 10 Breakthrough Technologies 2016". MIT Technology review. Massachusetts Institute of Technology. Retrieved 18 March 2016. ^ Larson C, Schaffer A (2014). "Genome Editing/ 10 Breakthrough Technologies 2014". Massachusetts Institute of Technology. Retrieved 18 March 2016. Doudna J, Mali P (23 March 2016). CRISPR-Cas: A Laboratory Manual. New York: Cold Spring Harbor Laboratory Press. ISBN 978-1-62182-131-1. Mohanraju P, Makarova KS, Zetsche B, Zhang F, Koonin EV, van der Oost J (August 2016). "Diverse evolutionary roots and mechanistic variations of the CRISPR-Cas systems". Science. 353 (6299): aad5147. doi:10.1126/science.aad5147. PMID 27493190. Sander JD, Joung JK (April 2014). "CRISPR-Cas systems for editing, regulating and targeting genomes". Nature Biotechnology. 32 (4): 347–55. doi:10.1038/nbt.2842. PMC 4022601  . PMID 24584096. Slaymaker IM, Gao L, Zetsche B, Scott DA, Yan WX, Zhang F (January 2016). "Rationally engineered Cas9 nucleases with improved specificity". Science. 351 (6268): 84–8. Bibcode:2016Sci...351...84S. doi:10.1126/science.aad5227. PMC 4714946  . PMID 26628643. Terns RM, Terns MP (March 2014). "CRISPR-based technologies: prokaryotic defense weapons repurposed". Trends in Genetics. 30 (3): 111–8. doi:10.1016/j.tig.2014.01.003. PMC 3981743  . PMID 24555991. Westra ER, Buckling A, Fineran PC (May 2014). "CRISPR-Cas systems: beyond adaptive immunity". Nature Reviews Microbiology. 12 (5): 317–26. doi:10.1038/nrmicro3241. PMID 24704746. Andersson AF, Banfield JF (May 2008). "Virus population dynamics and acquired virus resistance in natural microbial communities". Science. 320 (5879): 1047–50. Bibcode:2008Sci...320.1047A. doi:10.1126/science.1157358. PMID 18497291. Hale C, Kleppe K, Terns RM, Terns MP (December 2008). "Prokaryotic silencing (psi)RNAs in Pyrococcus furiosus". RNA. 14 (12): 2572–9. doi:10.1261/rna.1246808. PMC 2590957  . PMID 18971321.
van der Ploeg JR (June 2009). "Analysis of CRISPR in Streptococcus mutans suggests frequent occurrence of acquired immunity against infection by M102-like bacteriophages". Microbiology. 155 (Pt 6): 1966–76. doi:10.1099/mic.0.027508-0. PMID 19383692.
van der Oost J, Brouns SJ (November 2009). "RNAi: prokaryotes get in on the act". Cell. 139 (5): 863–5. doi:10.1016/j.cell.2009.11.018. PMID 19945373. Karginov FV, Hannon GJ (January 2010). "The CRISPR system: small RNA-guided defense in bacteria and archaea". Molecular Cell. 37 (1): 7–19. doi:10.1016/j.molcel.2009.12.033. PMC 2819186  . PMID 20129051. Pul U, Wurm R, Arslan Z, Geissen R, Hofmann N, Wagner R (March 2010). "Identification and characterization of E. coli CRISPR-cas promoters and their silencing by H-NS". Molecular Microbiology. 75 (6): 1495–512. doi:10.1111/j.1365-2958.2010.07073.x. PMID 20132443. Díez-Villaseñor C, Almendros C, García-Martínez J, Mojica FJ (May 2010). "Diversity of CRISPR loci in Escherichia coli". Microbiology. 156 (Pt 5): 1351–61. doi:10.1099/mic.0.036046-0. PMID 20133361. Deveau H, Garneau JE, Moineau S (2010). "CRISPR/Cas system and its role in phage-bacteria interactions". Annual Review of Microbiology. 64: 475–93. doi:10.1146/annurev.micro.112408.134123. PMID 20528693. Koonin EV, Makarova KS (December 2009). "CRISPR-Cas: an adaptive immunity system in prokaryotes". F1000 Biology Reports. 1: 95. doi:10.3410/B1-95. PMC 2884157  . PMID 20556198. "The age of the red pen". The Economist. August 22, 2015. ISSN 0013-0613. Retrieved 2015-08-25. Members of this family of bacterial proteins comprise various hypothetical proteins, as well as CRISPR (clustered regularly interspaced short palindromic repeats) associated proteins, conferring resistance to infection by certain bacteriophages. The CRISPR-Cas system is a prokaryotic defense mechanism against foreign genetic elements. The key elements of this defense system are the Cas proteins and the CRISPR RNA. Clustered Regularly Interspaced Short Palindromic Repeats (CRISPR) are a family of DNA direct repeats separated by regularly sized non-repetitive spacer sequences that are found in most bacterial and archaeal genomes [PUBMED:17442114]. CRISPRs appear to provide acquired resistance against mobile genetic elements (viruses, transposable elements and conjugative plasmids). CRISPR clusters contain sequences complementary to antecedent mobile elements and target invading nucleic acids. CRISPR clusters are transcribed and processed into CRISPR RNA (crRNA). The defense reaction is divided into three stages. In the adaptation stage, the invader DNA is cleaved, and a piece of it is selected to be integrated as a new spacer into the CRISPR locus, where it is stored as an identity tag for future attacks by this invader. During the second stage (the expression stage), the CRISPR RNA (pre-crRNA) is transcribed and subsequently processed into the mature crRNAs. In the third stage (the interference stage), Cas proteins, together with crRNAs, identify and degrade the invader [PUBMED:17379808, PUBMED:16545108, PUBMED:21699496]. The CRISPR-Cas systems have been sorted into three major classes. In CRISPR-Cas types I and III, the mature crRNA is generally generated by a member of the Cas6 protein family. Whereas in system III the Cas6 protein acts alone, in some class I systems it is part of a complex of Cas proteins known as Cascade (CRISPR-associated complex for antiviral defense). The Cas6 protein is an endoribonuclease necessary for crRNA production whereas the additional Cas proteins that form the Cascade complex are needed for crRNA stability [PUBMED:24459147]. For those sequences which have a structure in the Protein DataBank, we use the mapping between UniProt, PDB and Pfam coordinate systems from the PDBe group, to allow us to map Pfam domains onto UniProt sequences and three-dimensional protein structures. The table below shows the structures on which the CRISPR_Cas2 domain has been found. There are 35 instances of this domain found in the PDB. Note that there may be multiple copies of the domain in a single PDB structure, since many structures contain multiple copies of the same protein sequence.